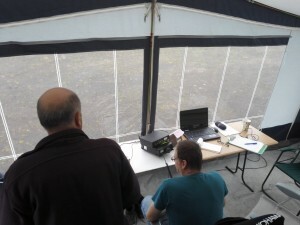 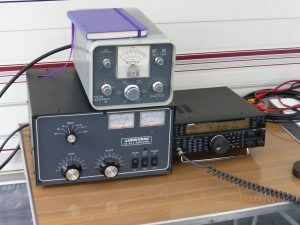 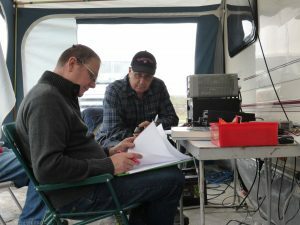 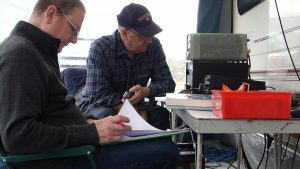 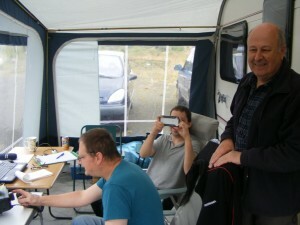 Club members participated in the Practical Wireless 144MHz QRP contest again this year. 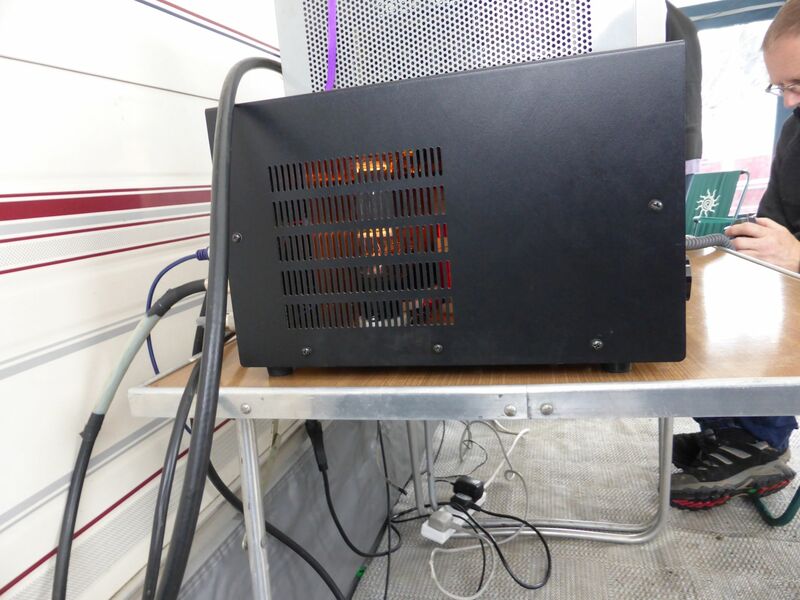 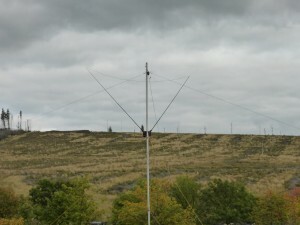 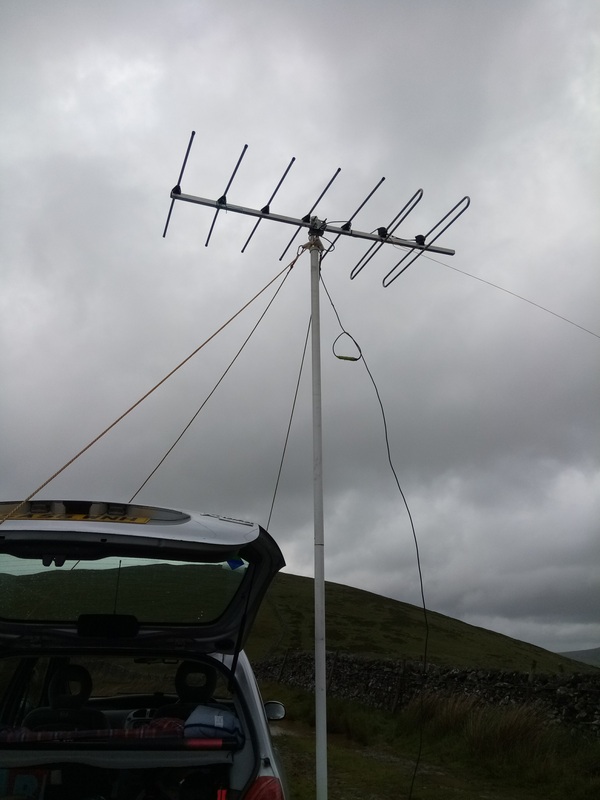 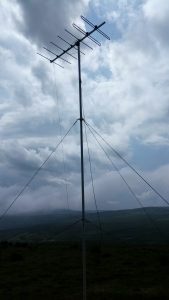 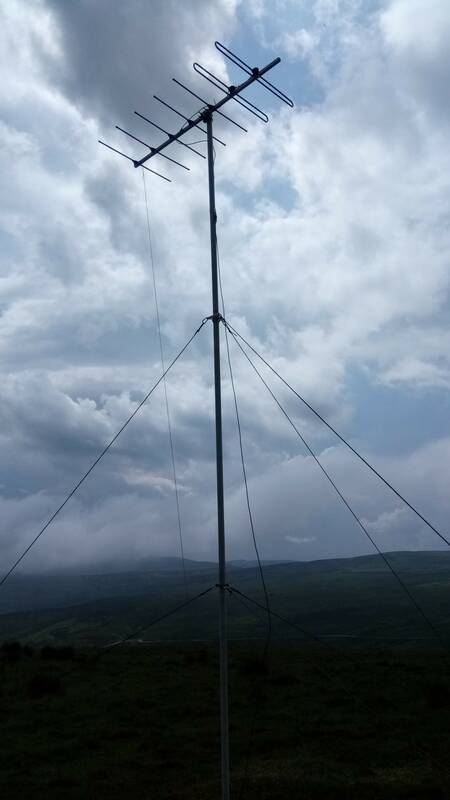 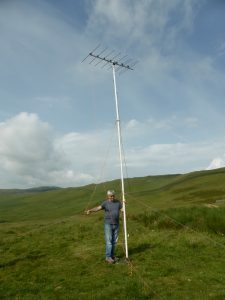 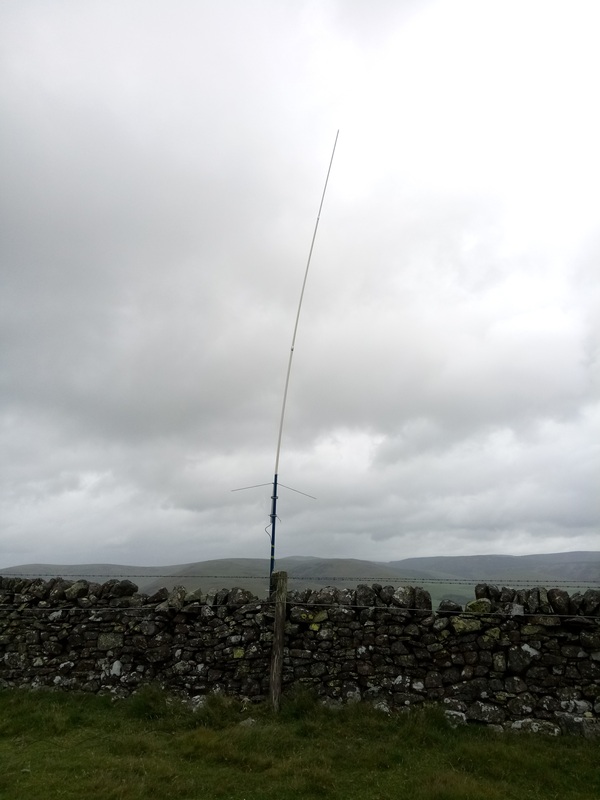 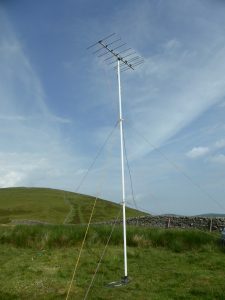 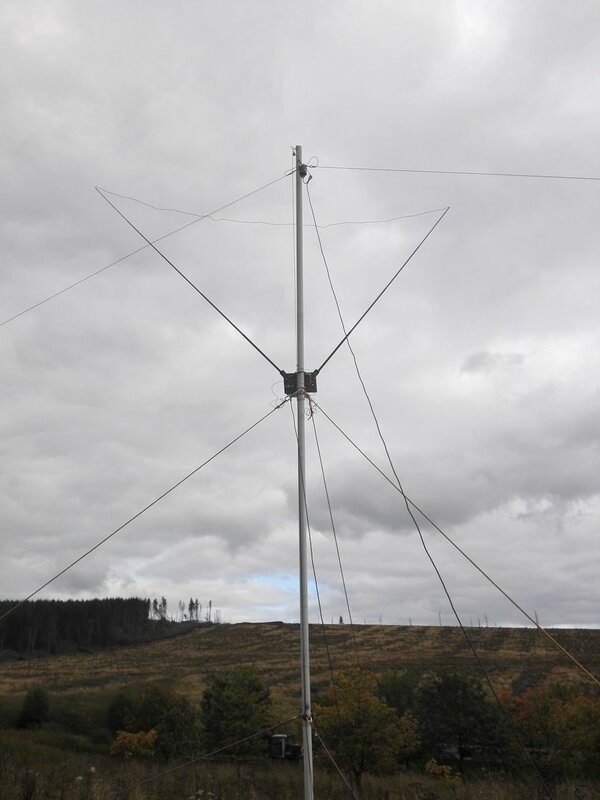 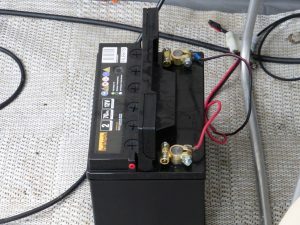 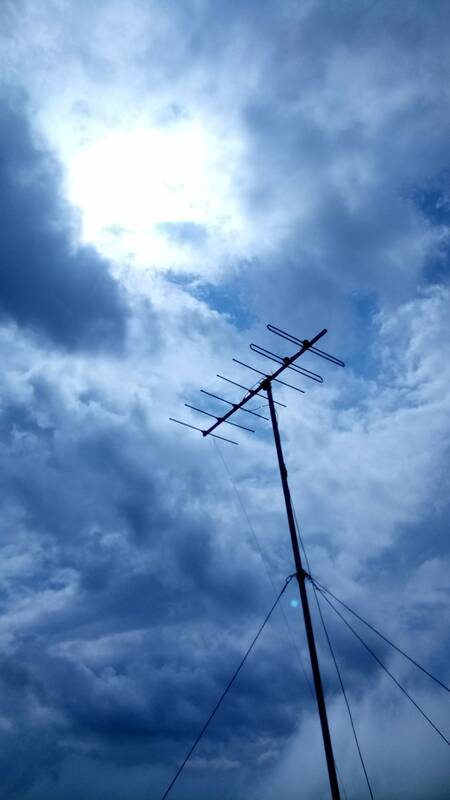 The aim is to contact and exchange details with as many other stations as we can through the day, all over the country, using 5 watts of power maximum, on 144Mhz band which is usually “line-of-sight” only. 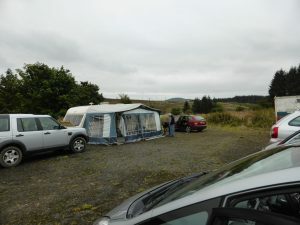 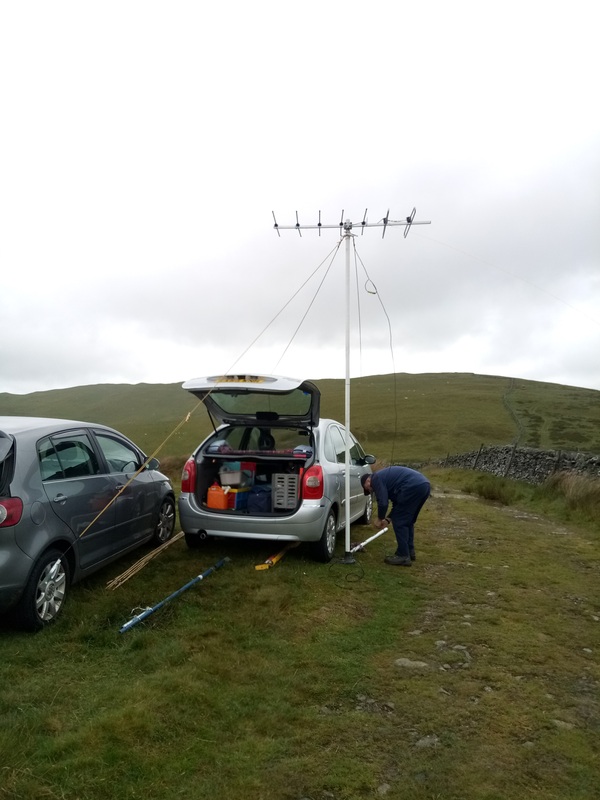 We were slightly more successful than last year, even though we had a few episodes of thunder and heavy rain and had to retreat to the vehicles. 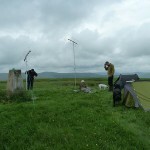 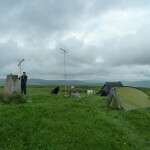 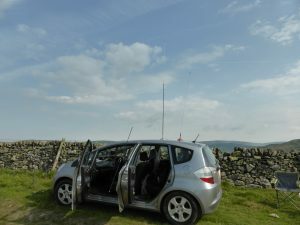 Contacted stations from the north of Scotland right down to the south coast of England. 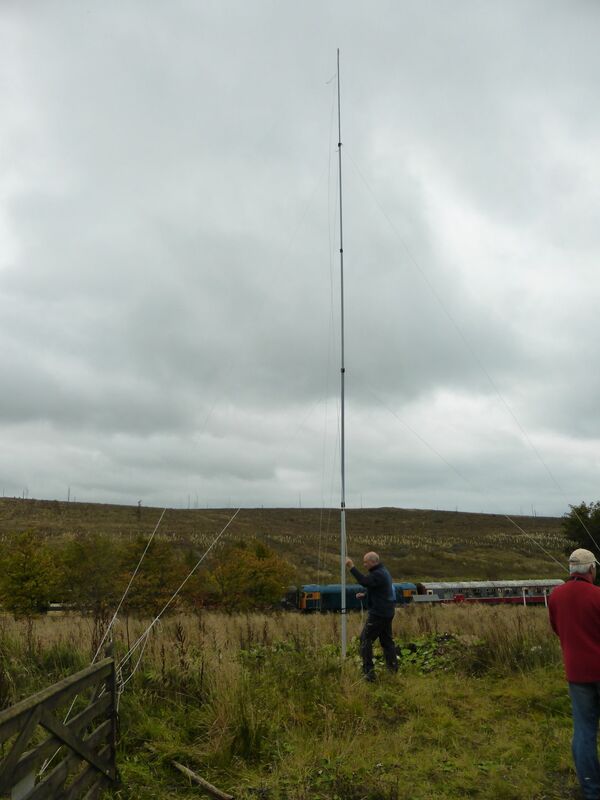 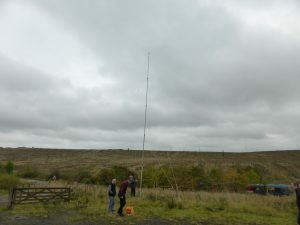 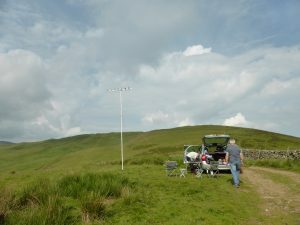 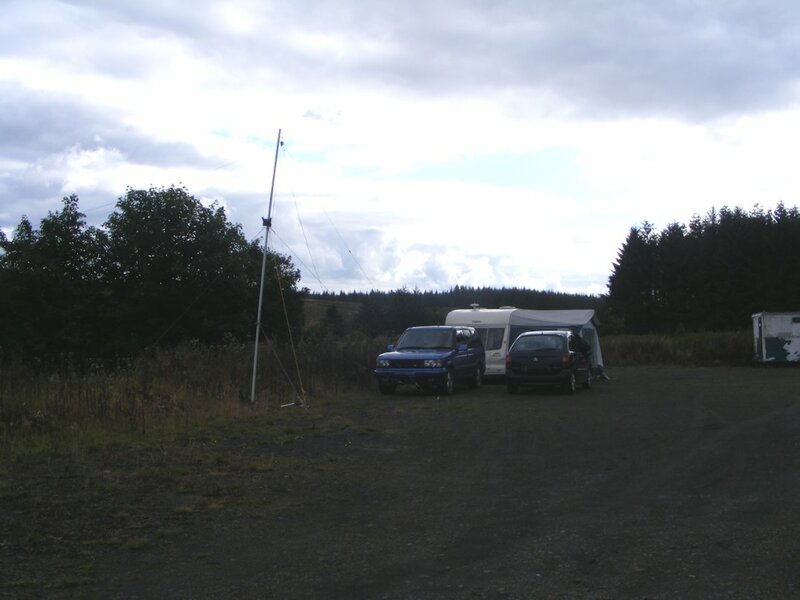 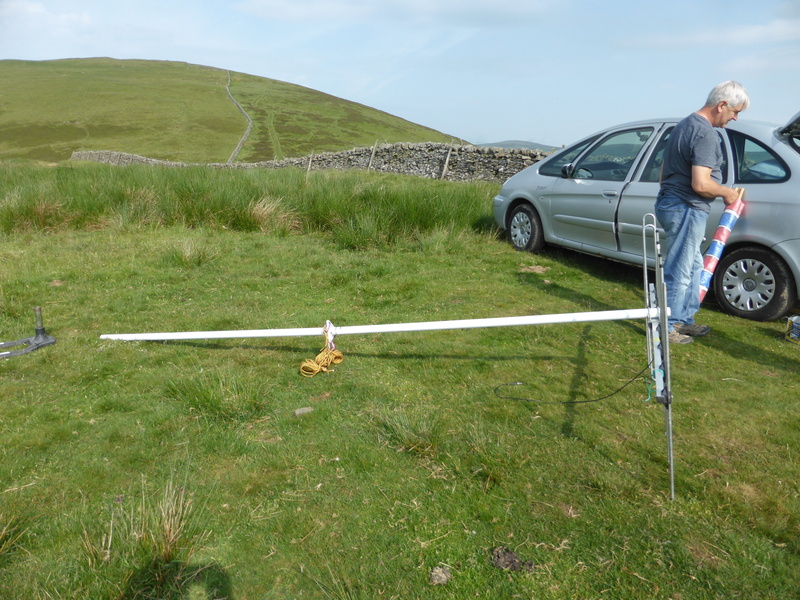 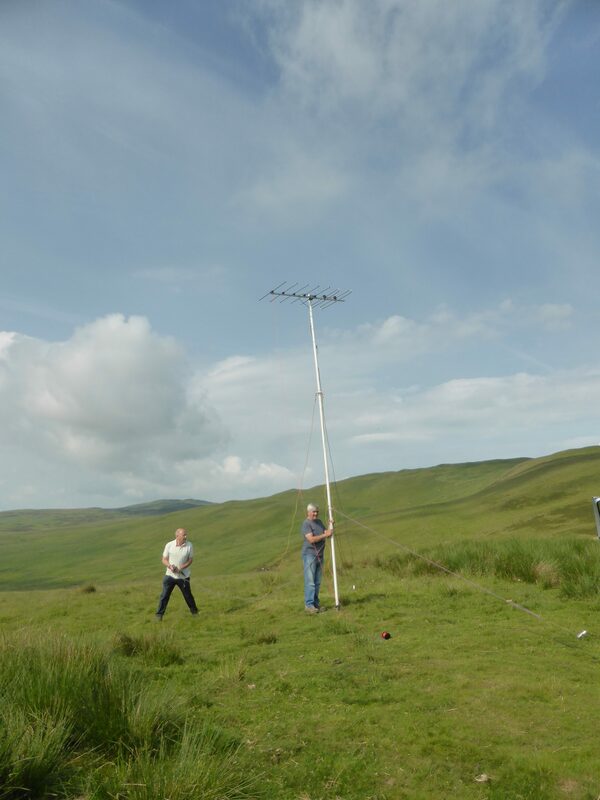 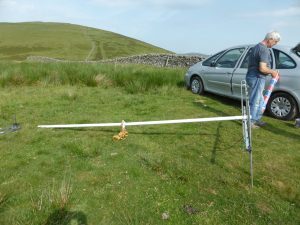 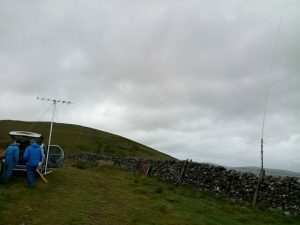 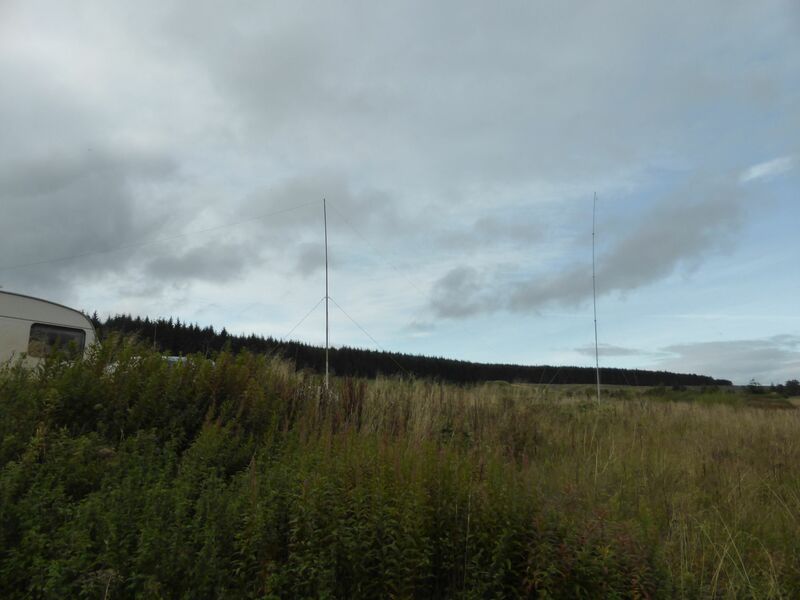 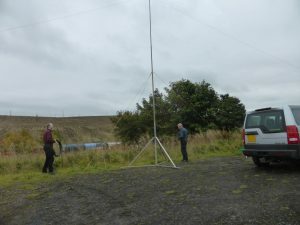 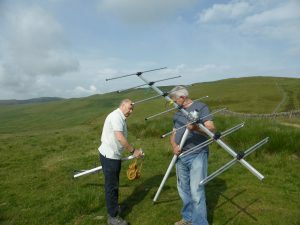 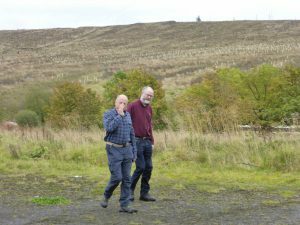 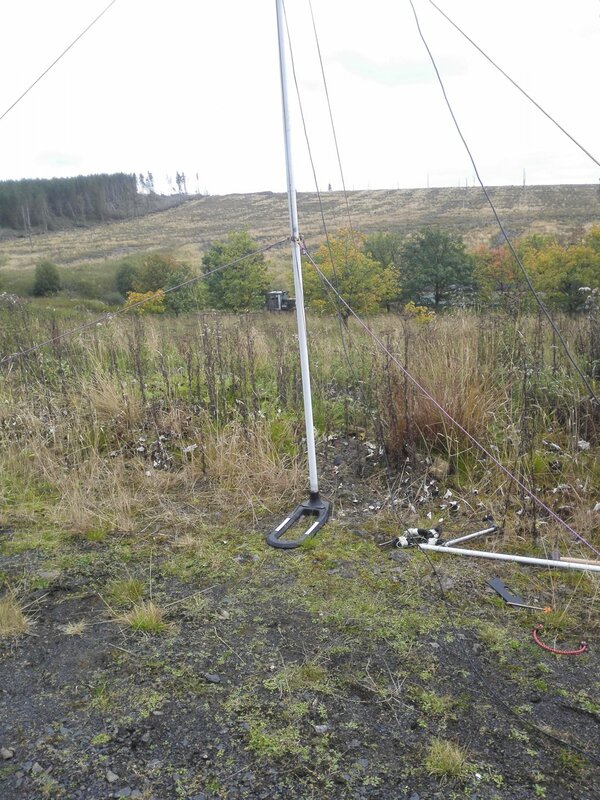 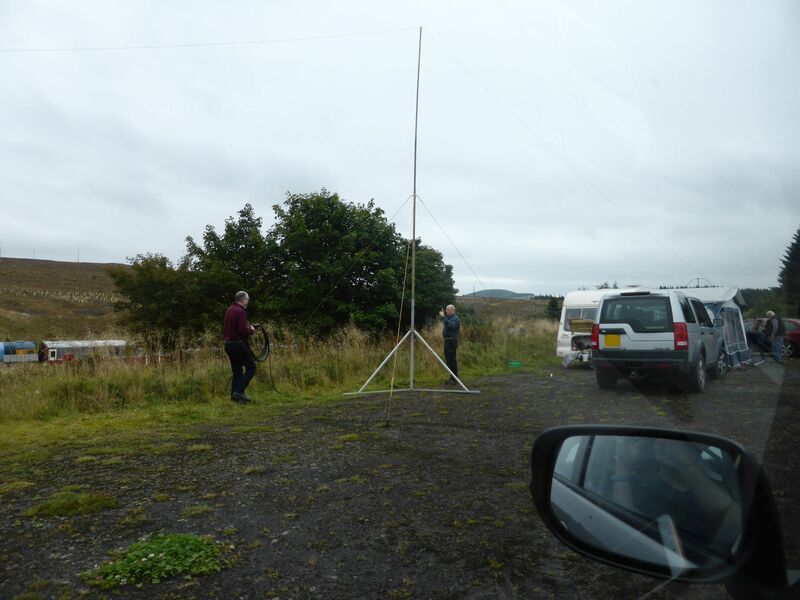 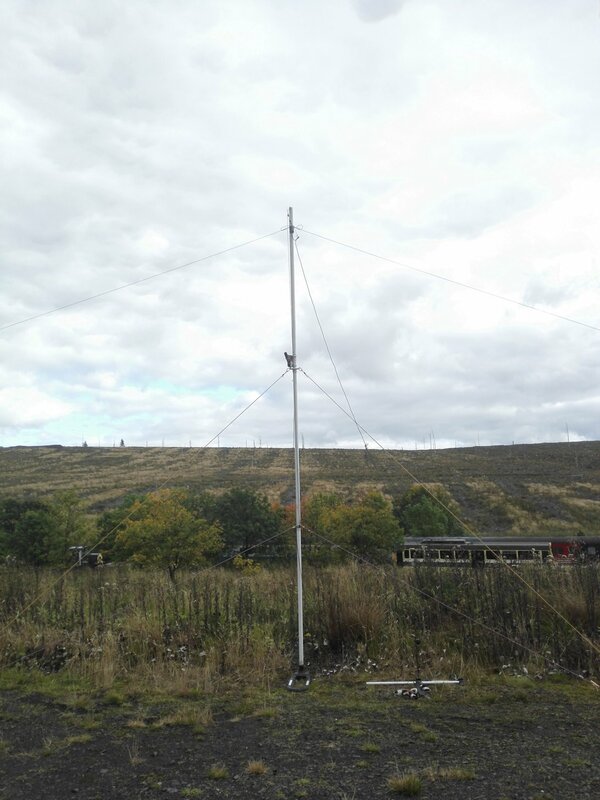 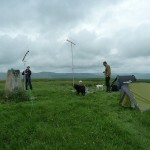 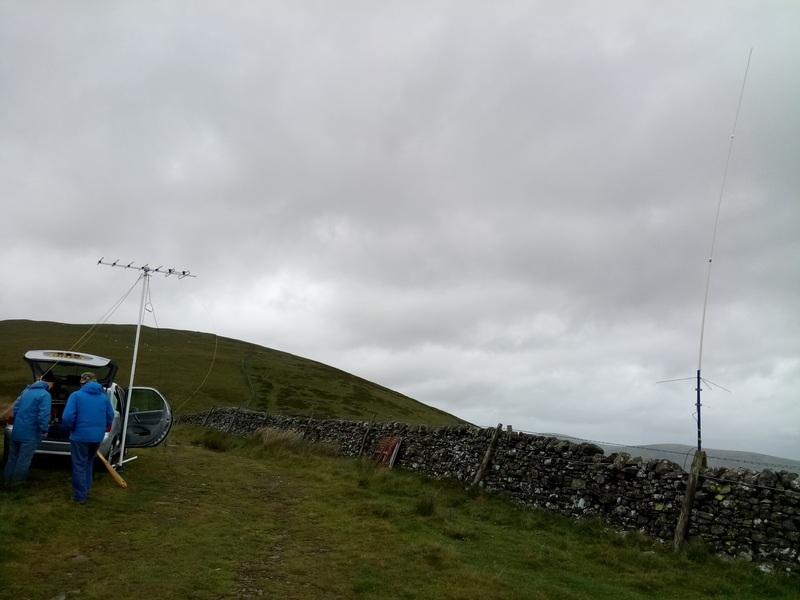 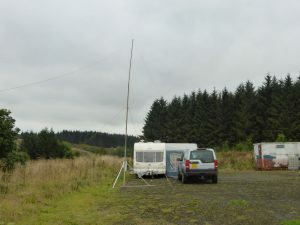 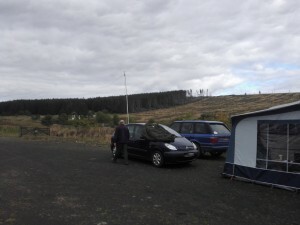 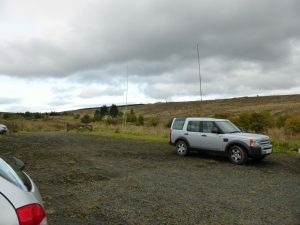 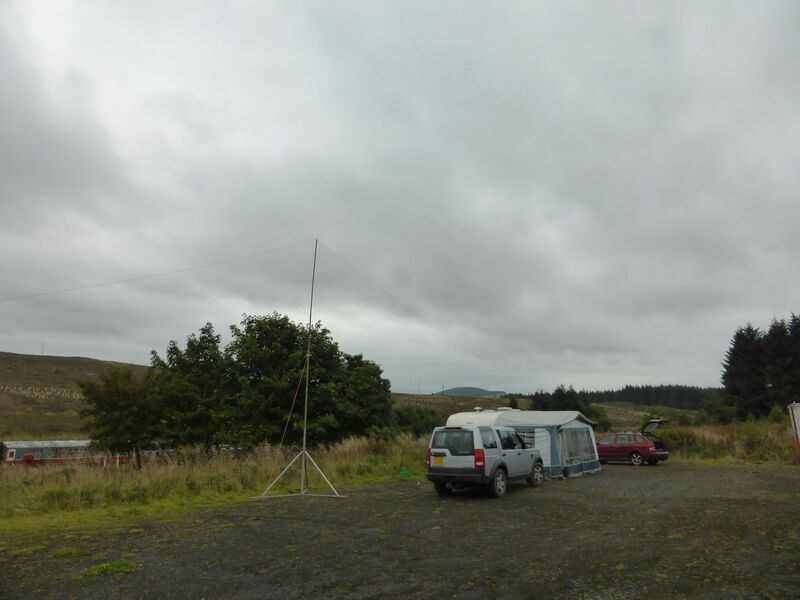 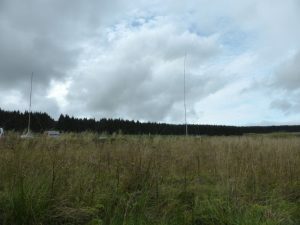 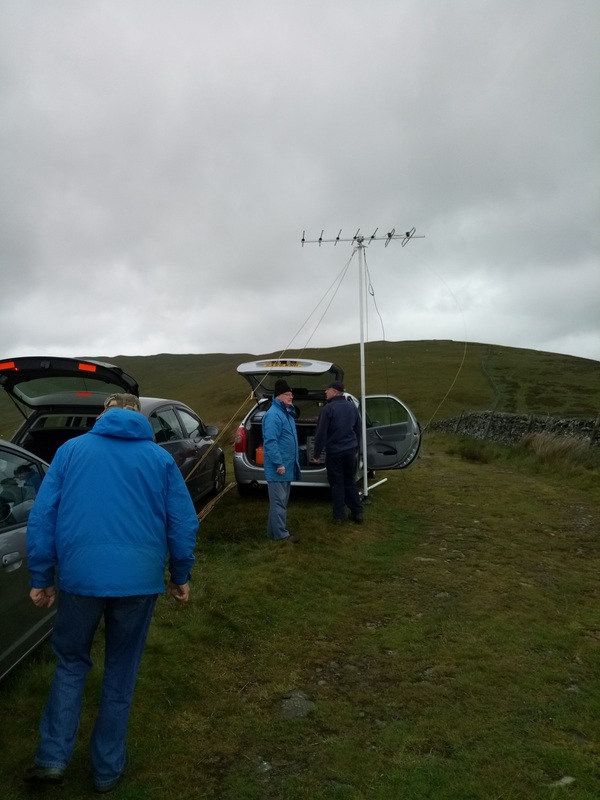 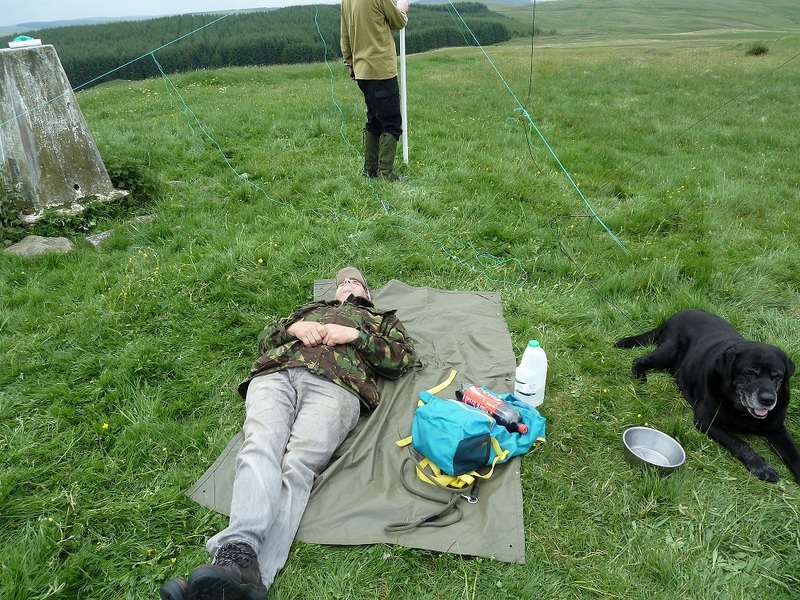 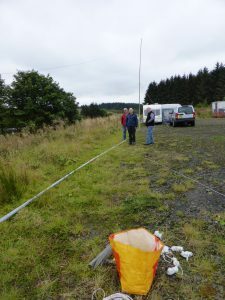 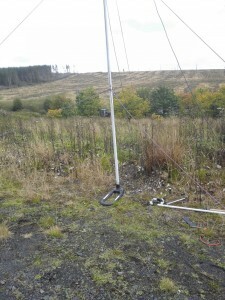 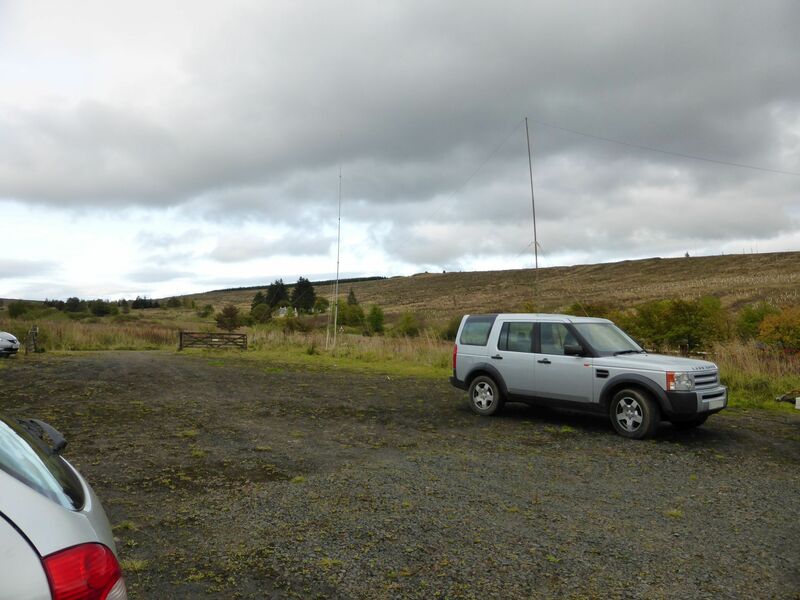 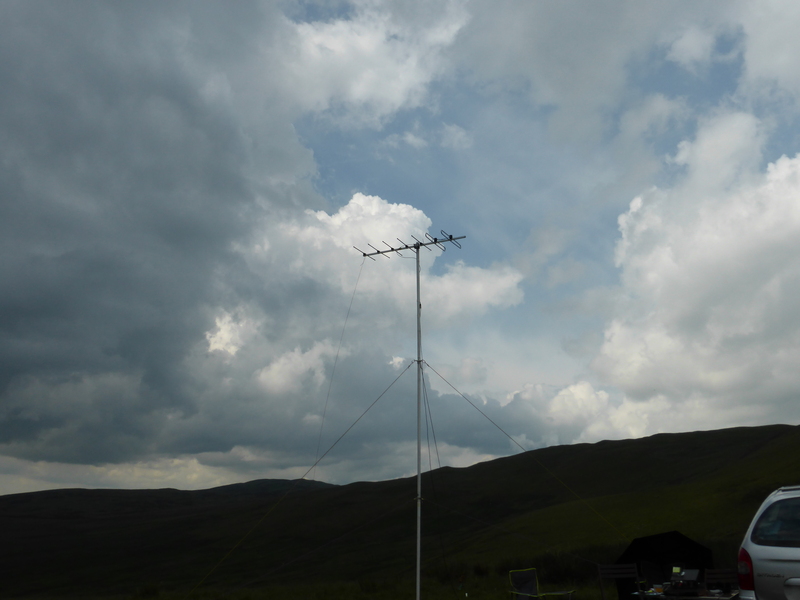 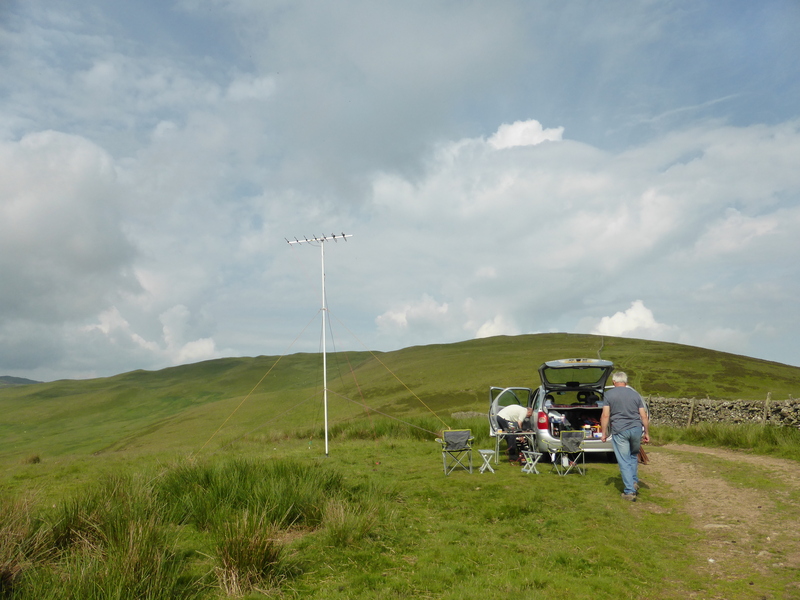 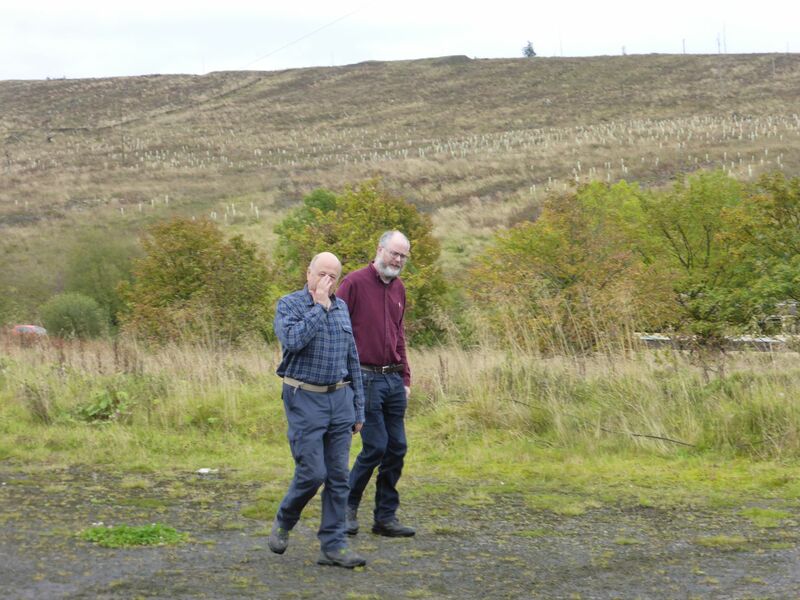 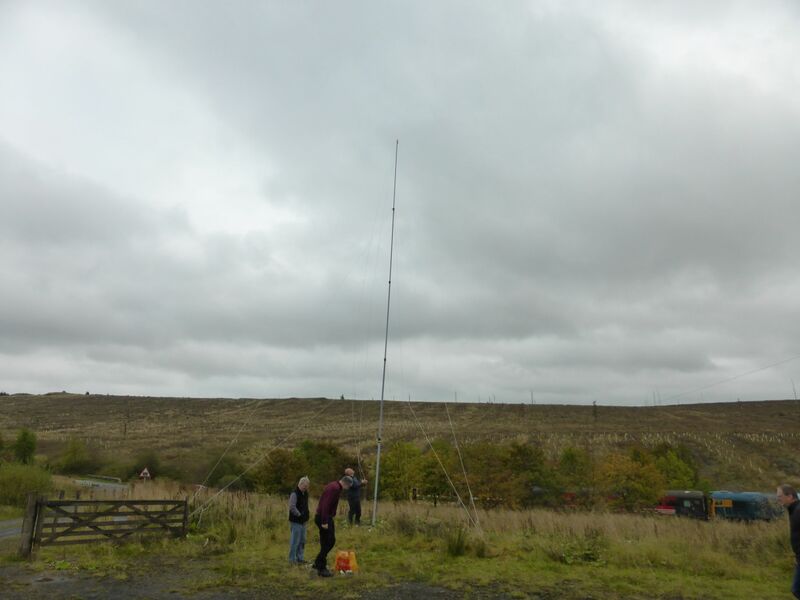 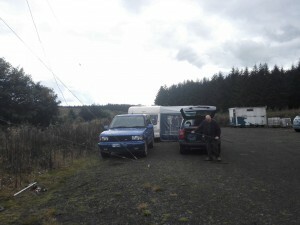 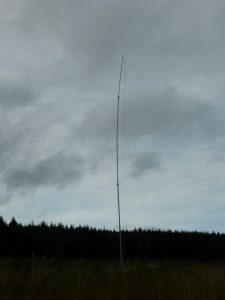 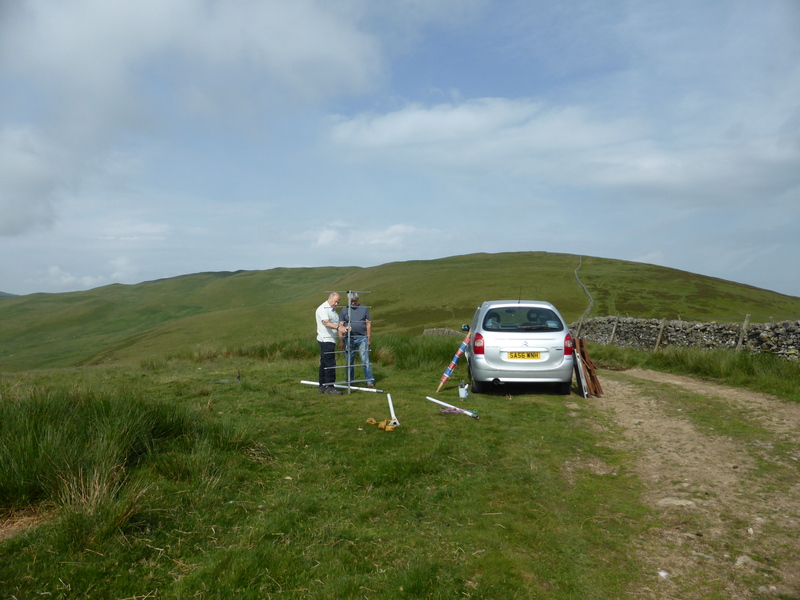 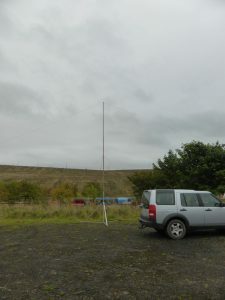 Thanks to our operators Dave and Jim, Dave and George for getting the station set up and antenna erected, Mike for logging, and the other club members who came to support us during the day. 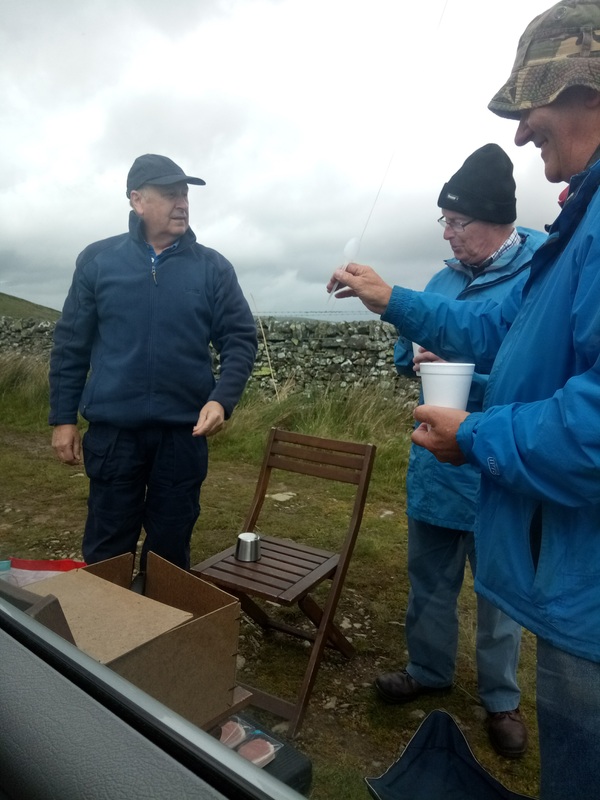 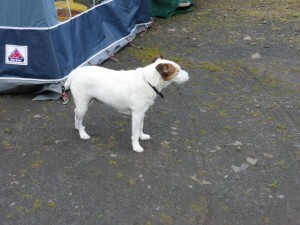 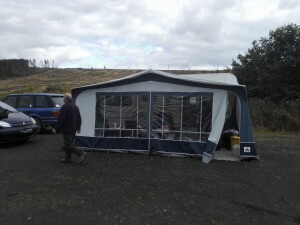 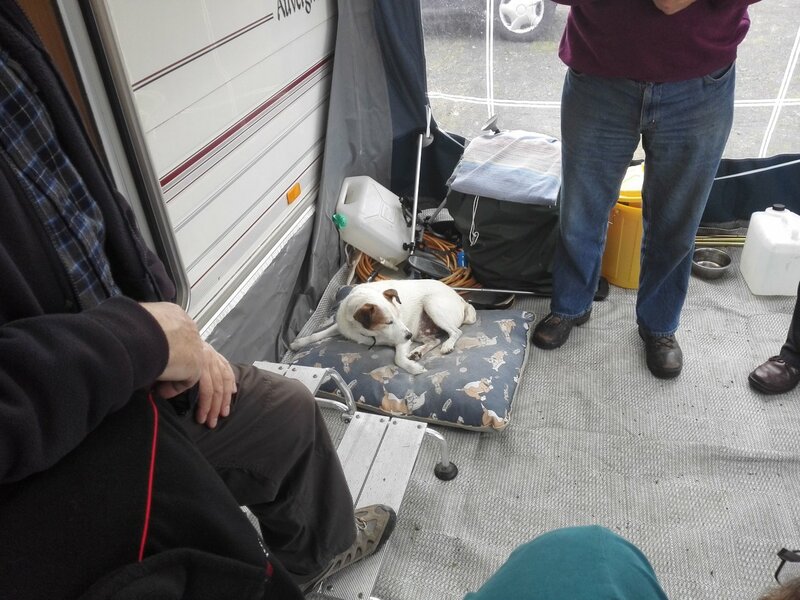 Also special thanks to Dave for the coffee and fresh bacon rolls cooked on the portable gas stove! 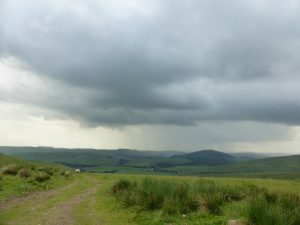 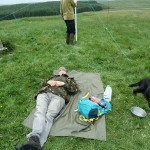 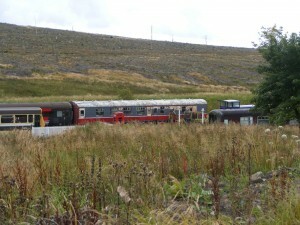 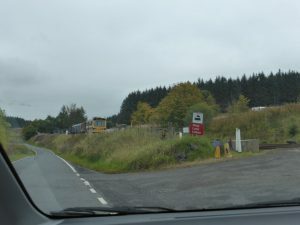 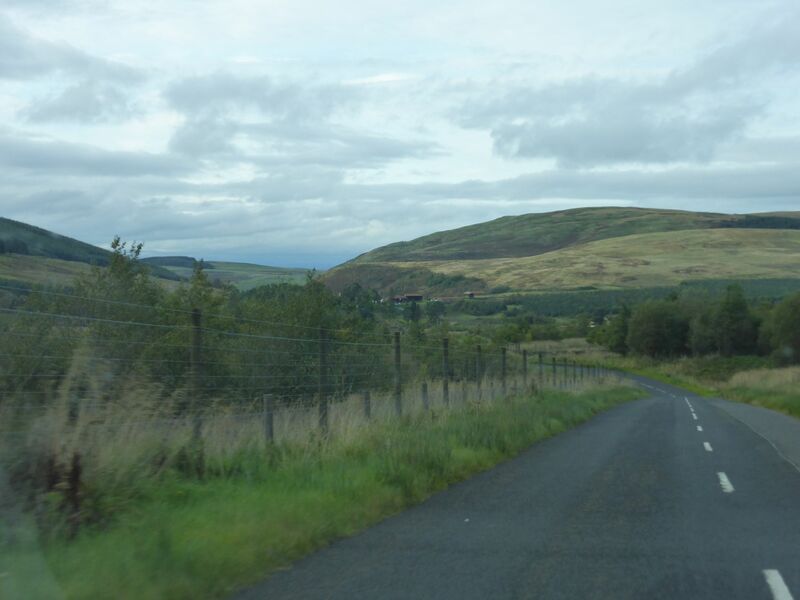 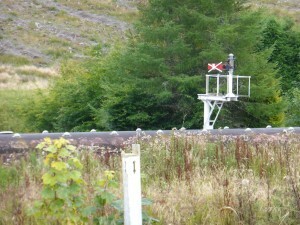 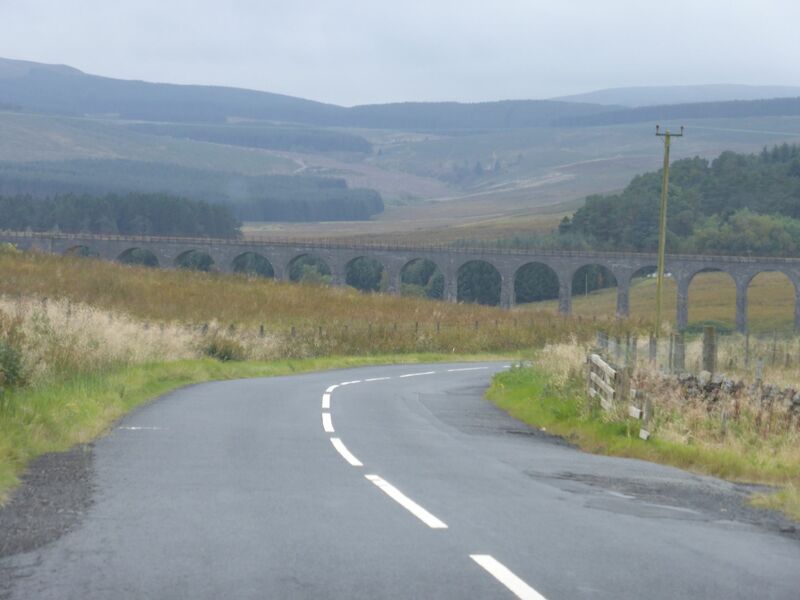 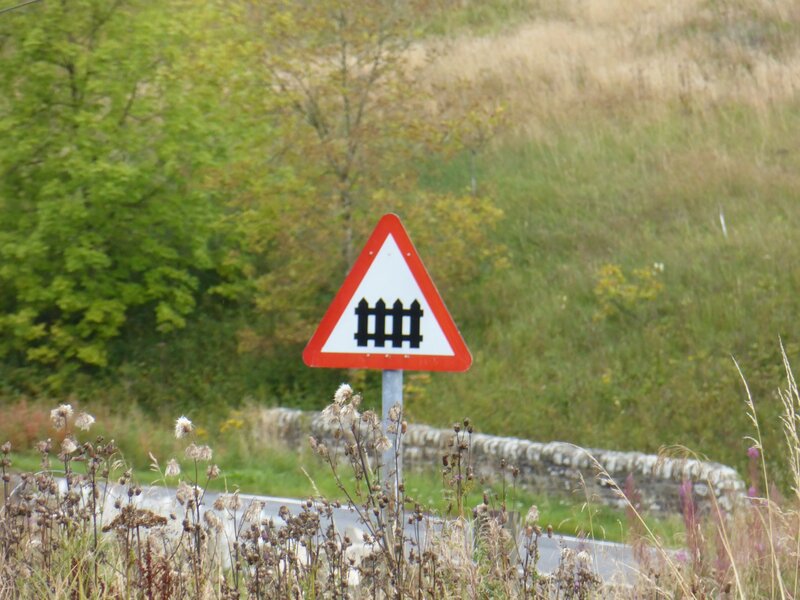 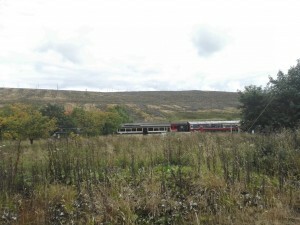 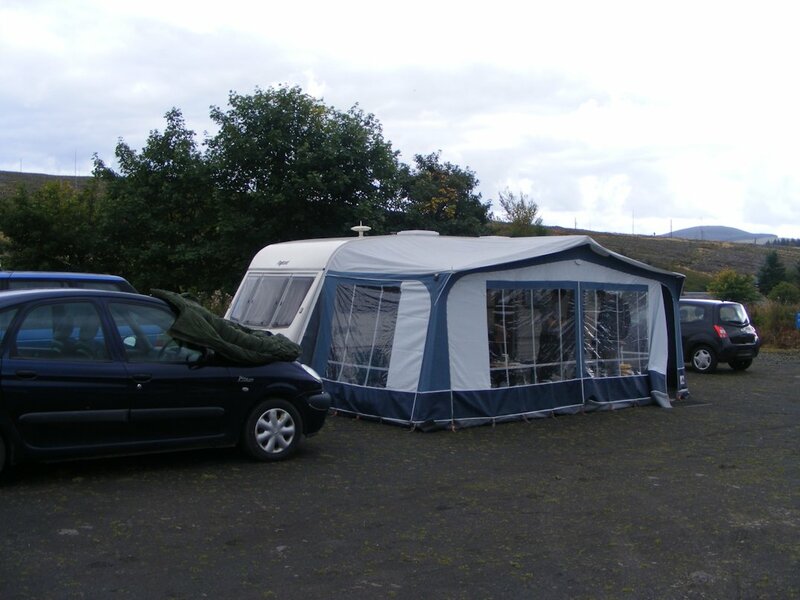 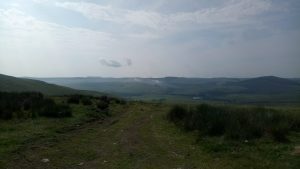 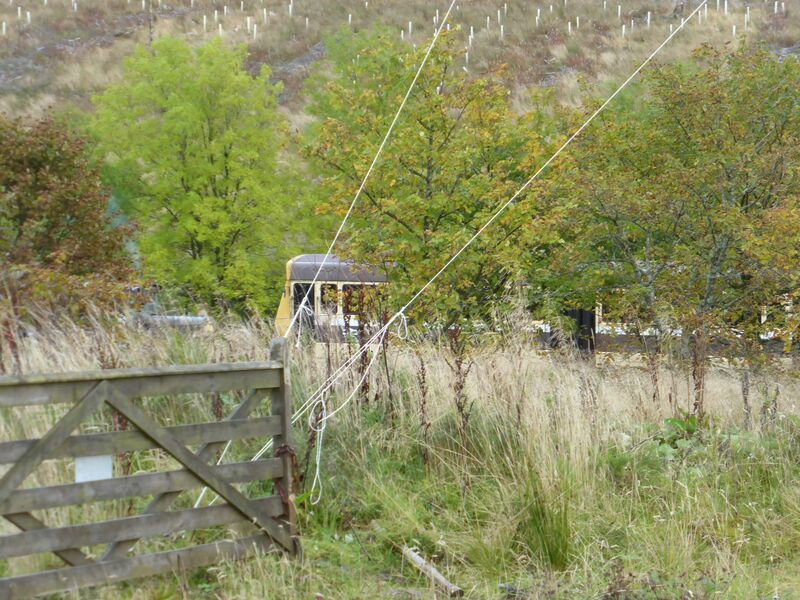 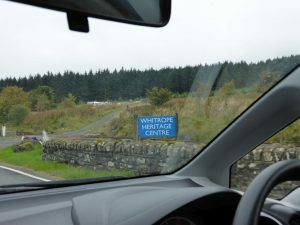 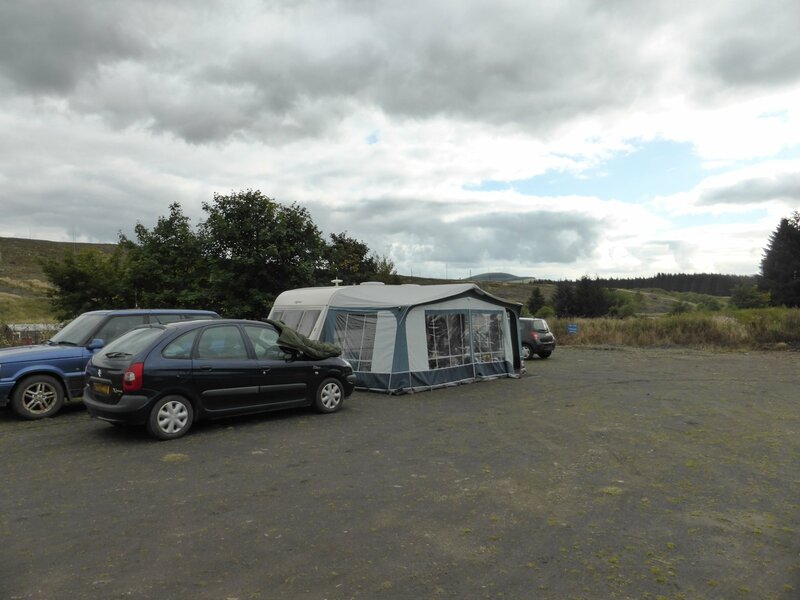 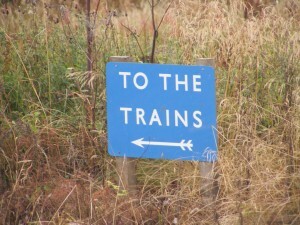 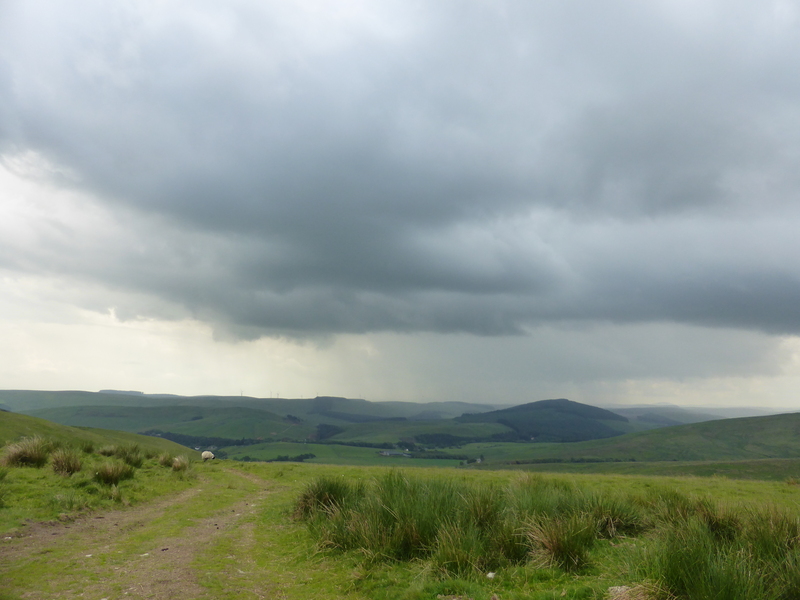 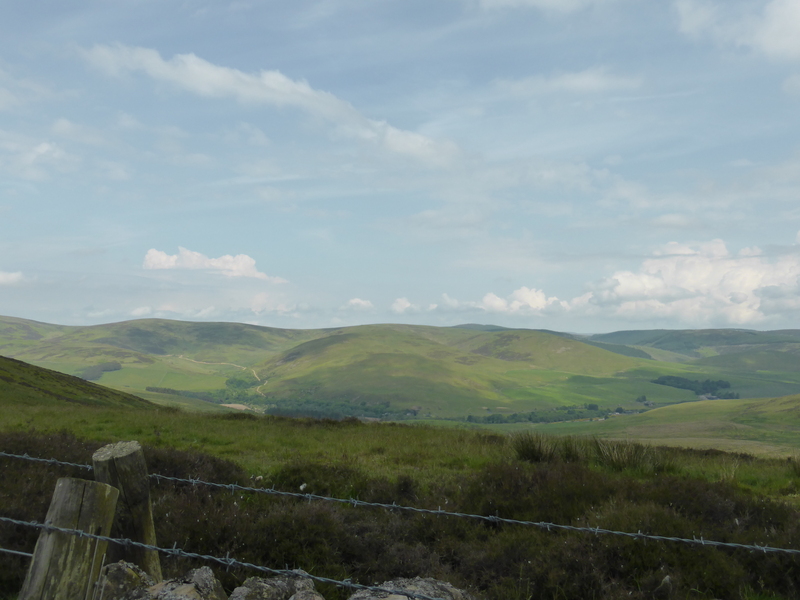 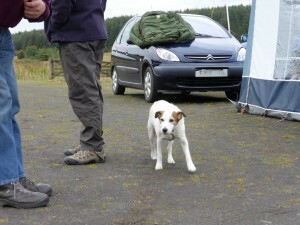 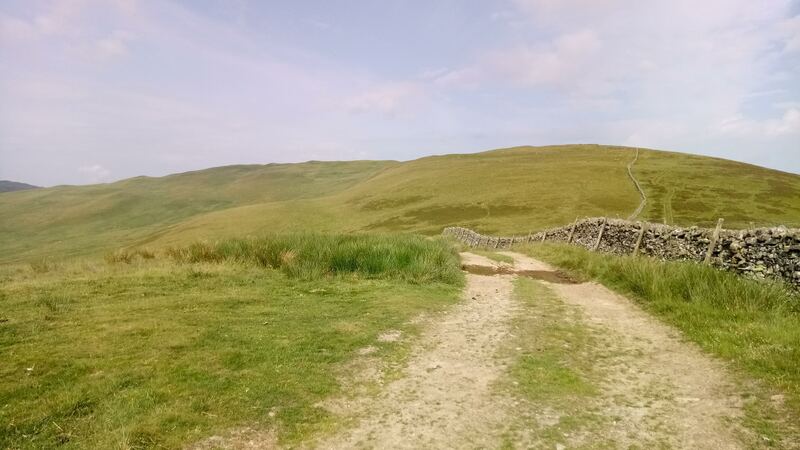 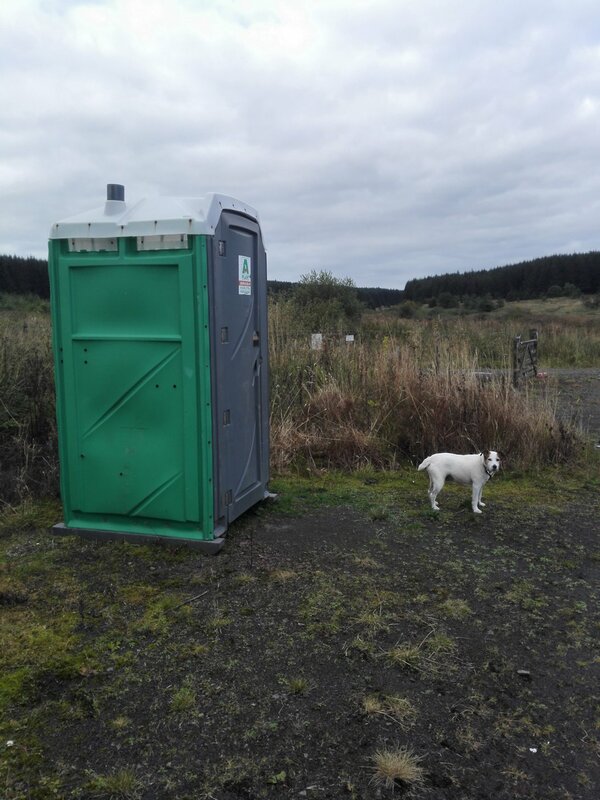 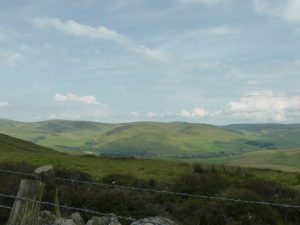 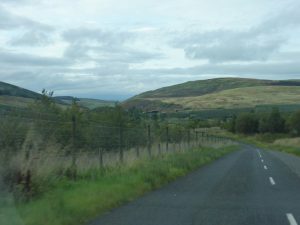 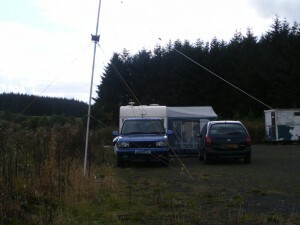 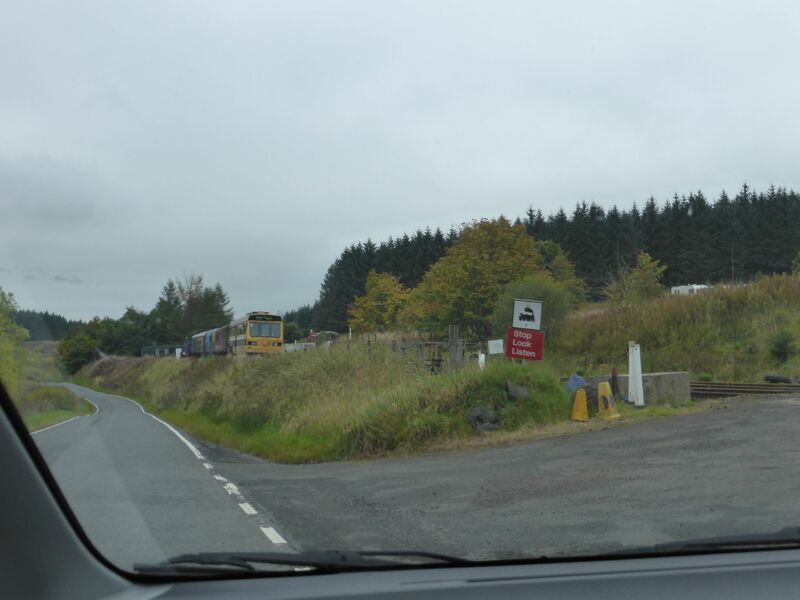 As usual we were located at the top of “Middle Swire” between Yarrow and Ettrickbridge, 6 miles west of Selkirk. The day started off nice, then the clouds rolled in and the rain started. 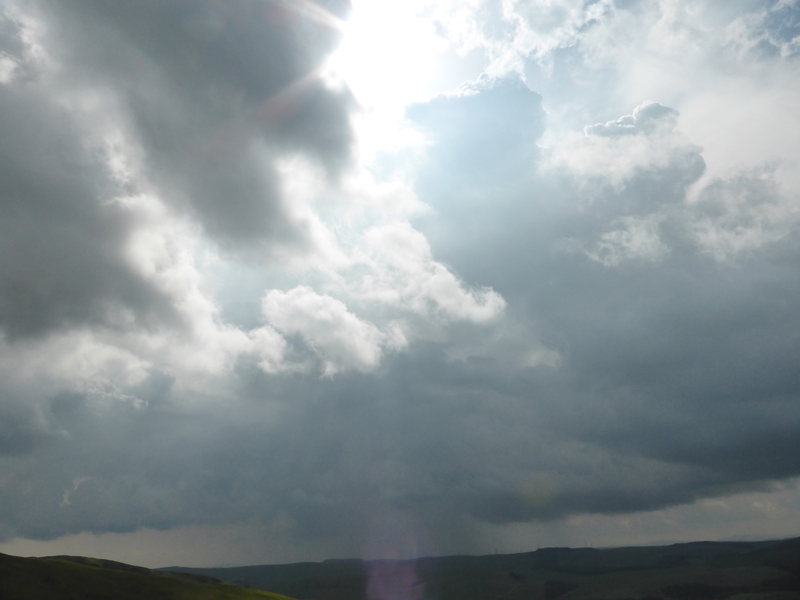 The day started off nice. 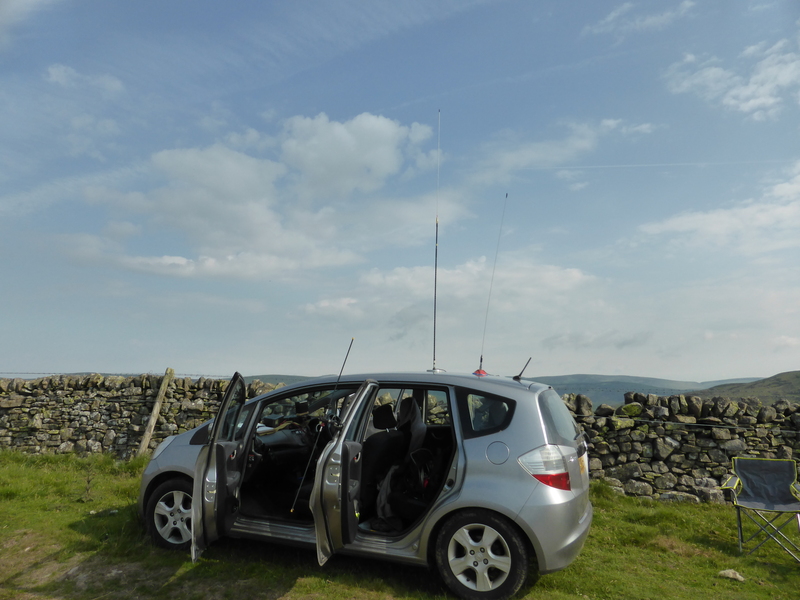 George’s car equipped for some HF and VHF listening while we’re up the hill. 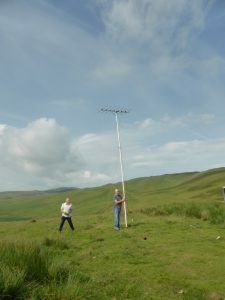 George and Dave building the antenna pole. This battery should last long enough. 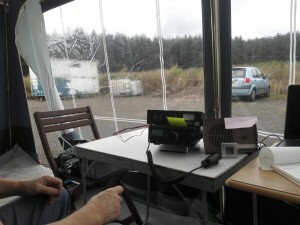 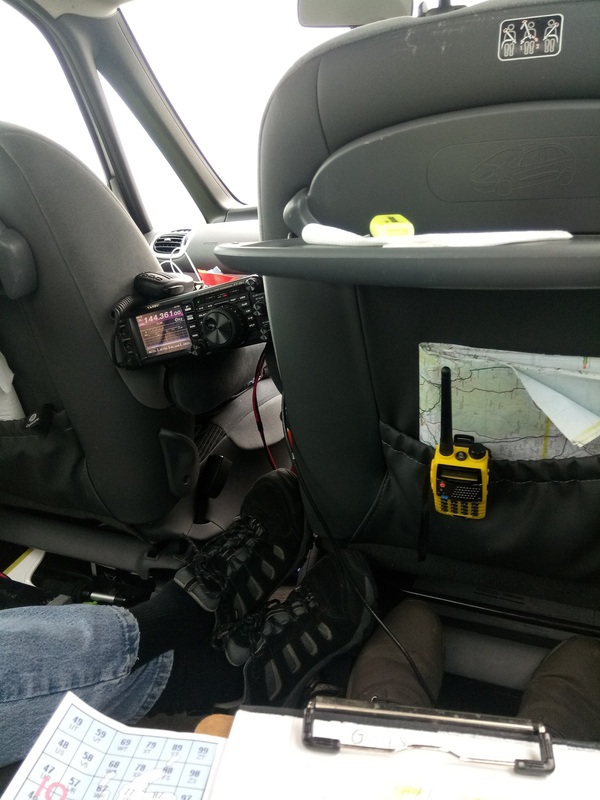 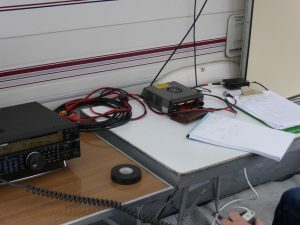 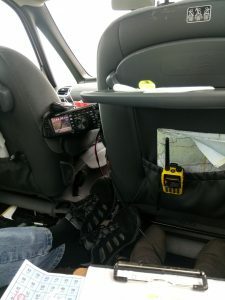 Playing with HF while waiting to start contesting on VHF…. 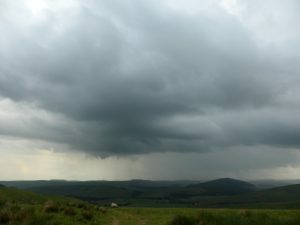 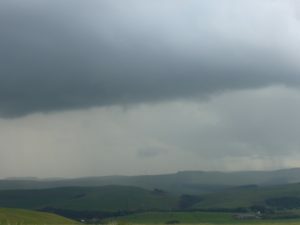 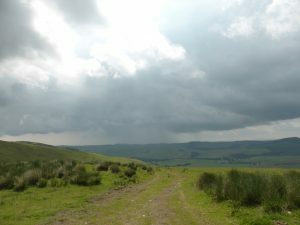 and watching the heavy showers dodge us. 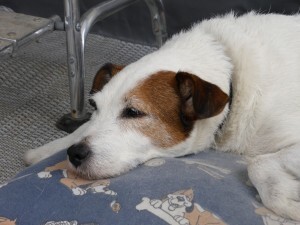 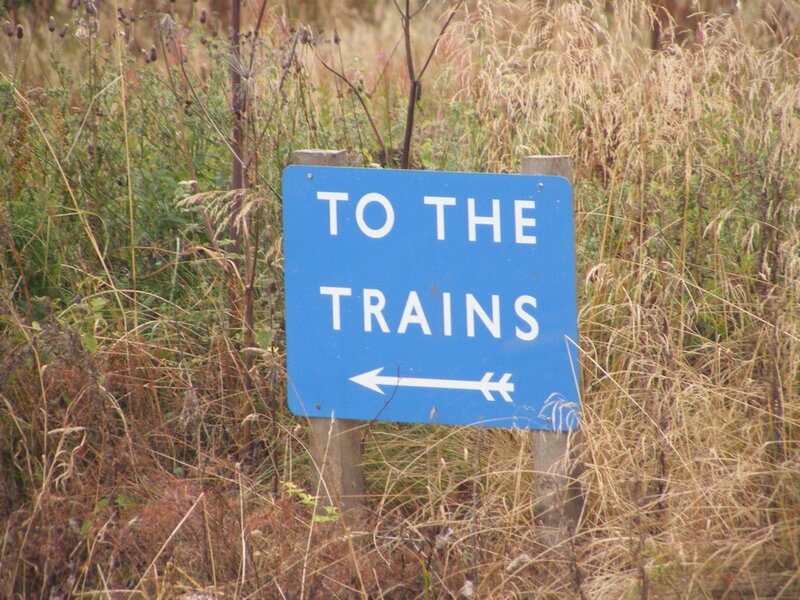 For now…. 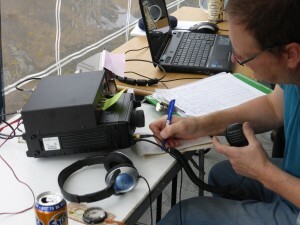 Calling CQ for any stations listening. Callsign and locator on the sheet for reference. 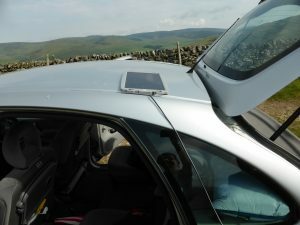 Notice the DIY audio reflector for the on-board speaker. 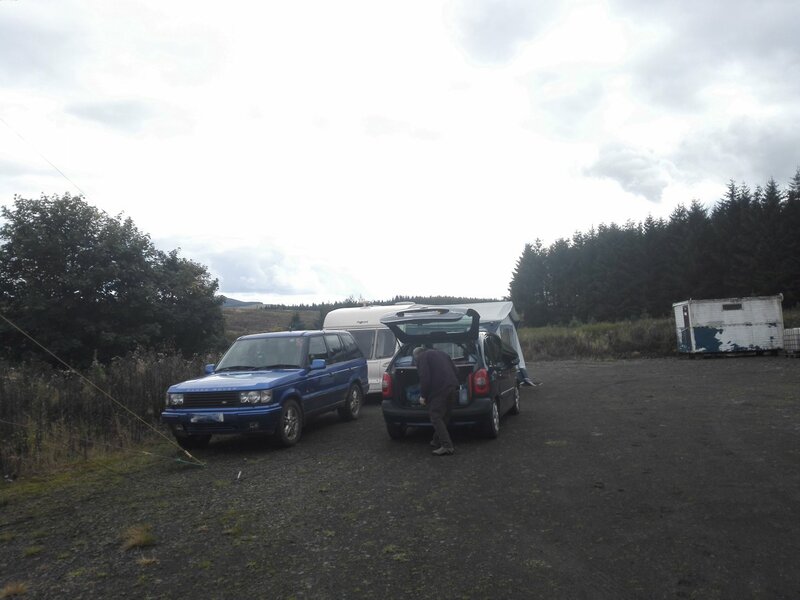 Okay boys, time to retreat to the vehicles! Rain started. 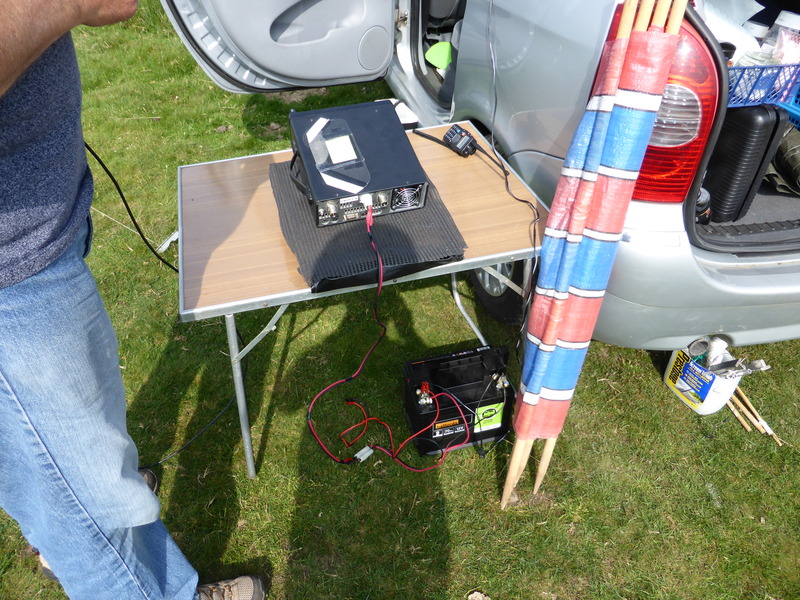 Getting very noisy and crackly on the radio now. 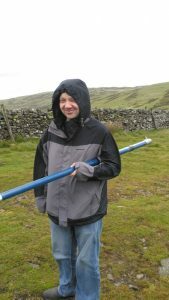 Acutely aware there’s lightning around and we’re next to a tall metal pole with a trailing cable leading inside the car. 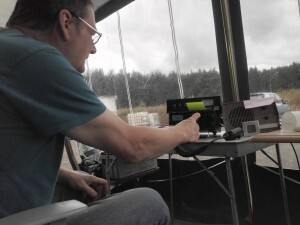 The radio was disconnected for the short time the bursts of static became a constant loud crackle. 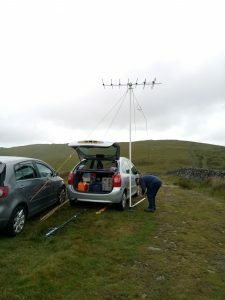 Not that we could hear the radio anyway over the sound of the rain battering off the roof of the car. 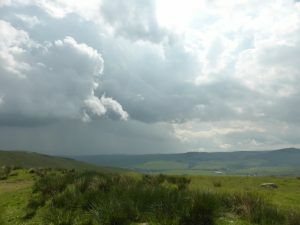 These were taken during the breaks inbetween showers. 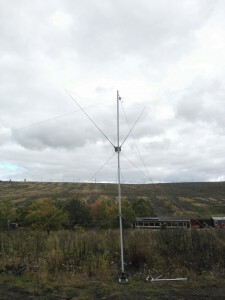 At the end these were the squares that we had contacts in. 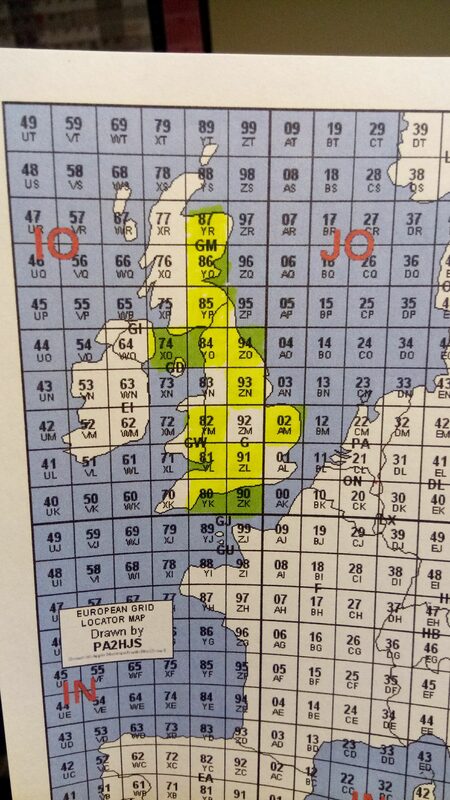 Shame we missed IO83 and IO92. 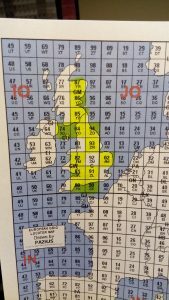 Altogether (to be confirmed by the invigilator) 28 contacts (we had a duplicate that nobody noticed at the time) in 13 squares. 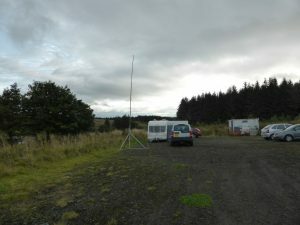 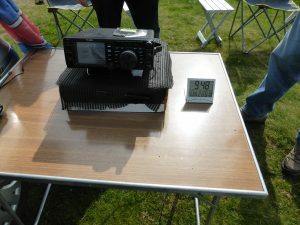 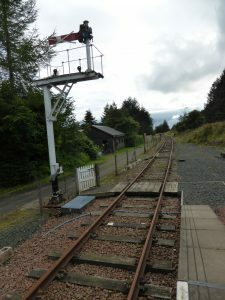 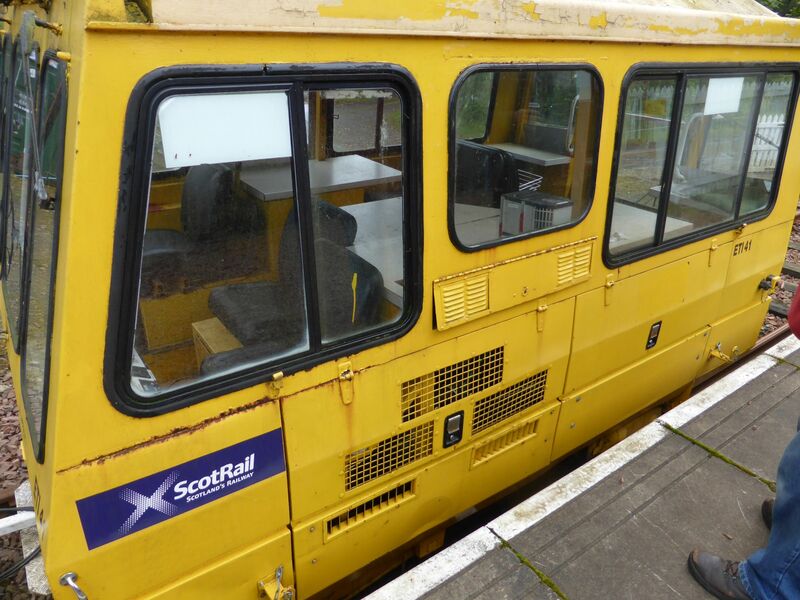 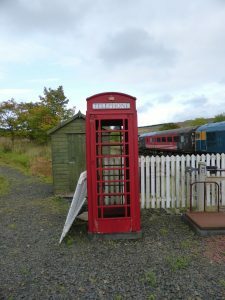 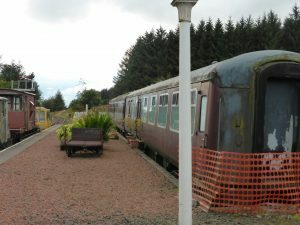 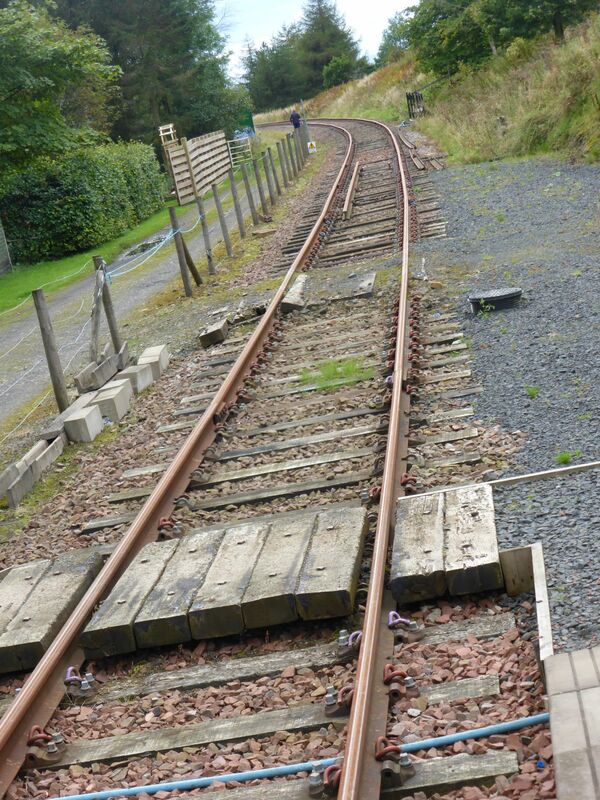 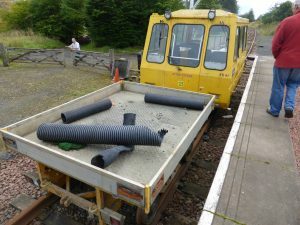 Just need to wait and see how well we did compared to other stations, particularly the Scottish ones as we won Best Scottish station of last year’s contest. 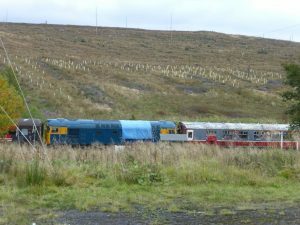 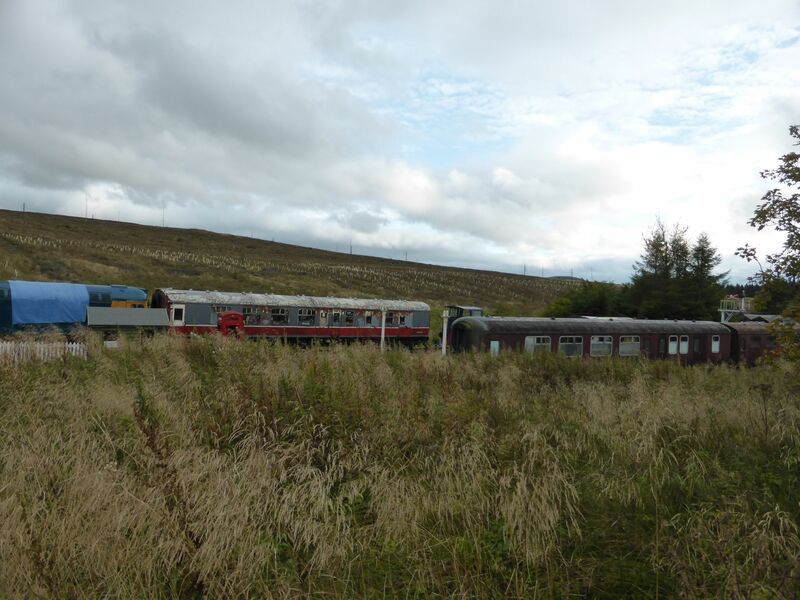 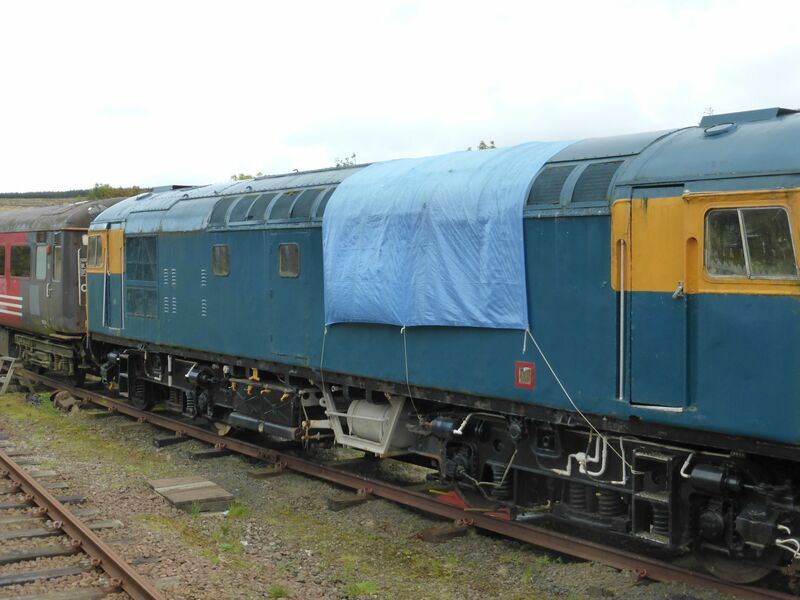 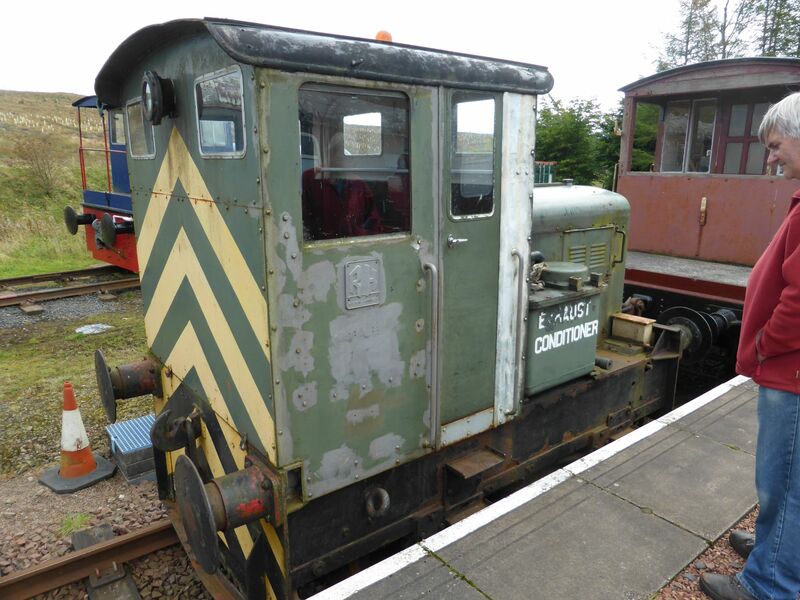 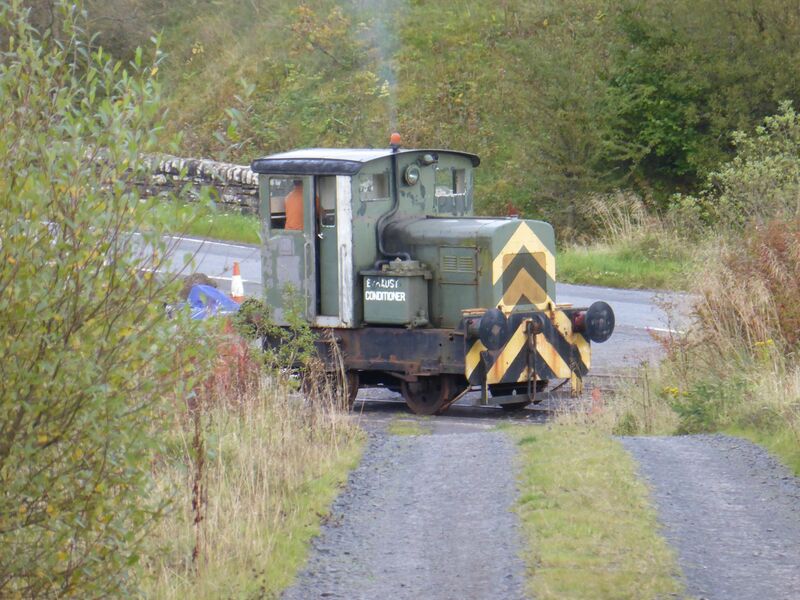 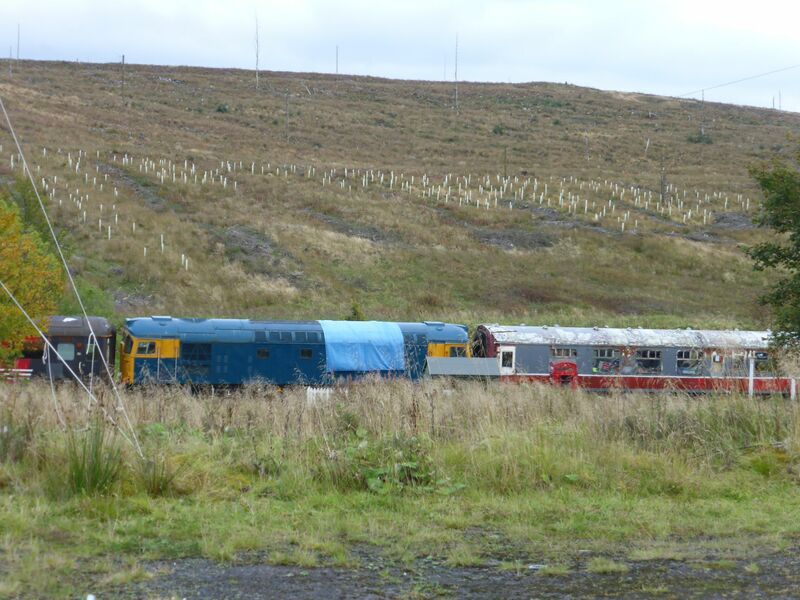 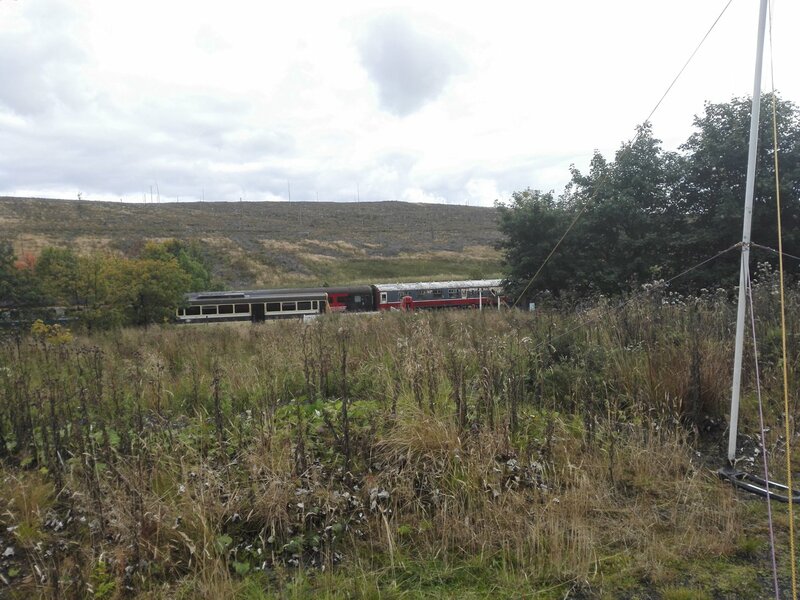 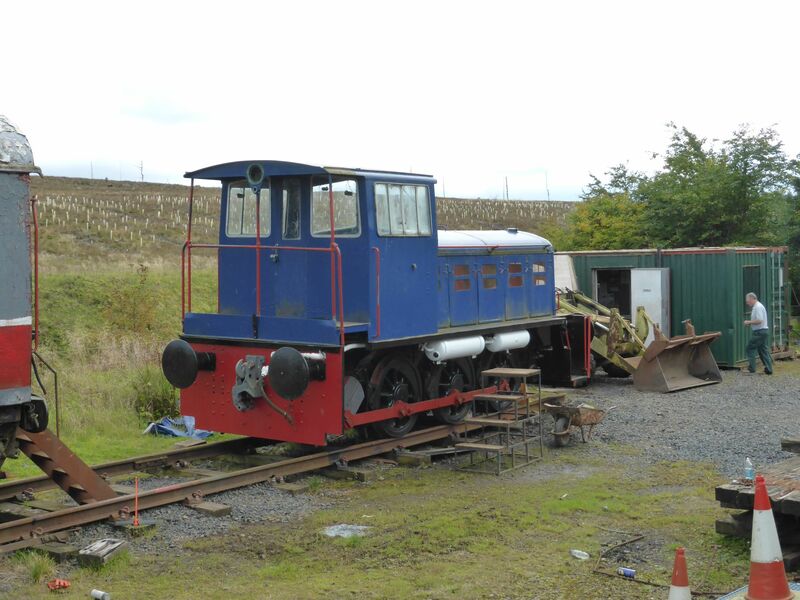 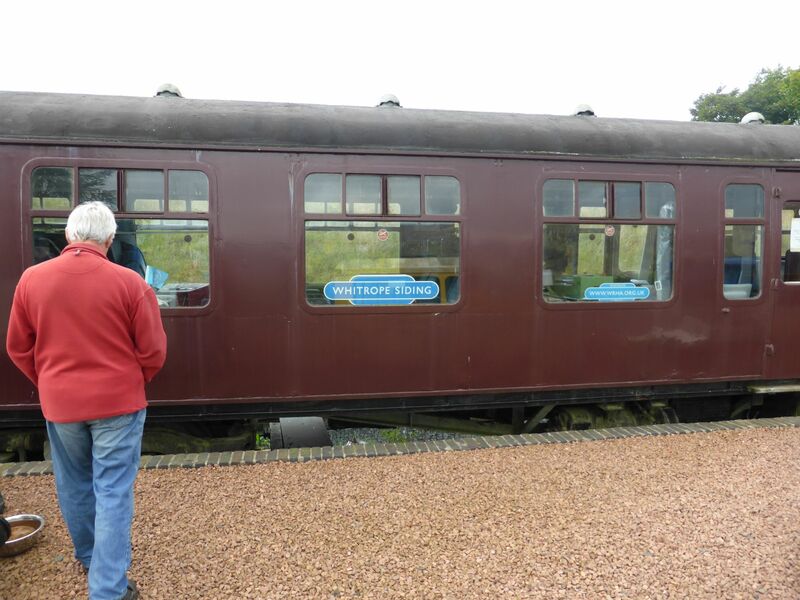 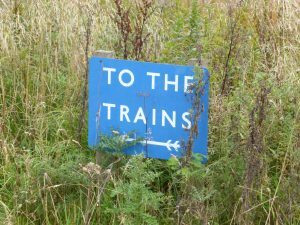 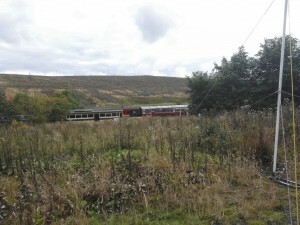 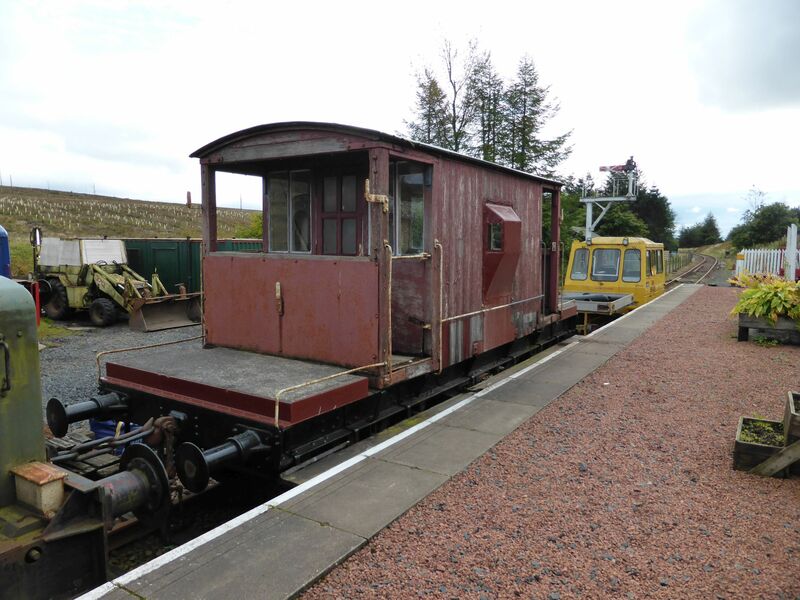 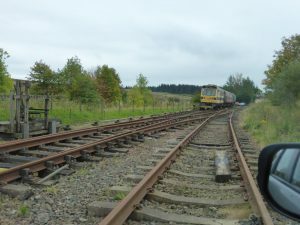 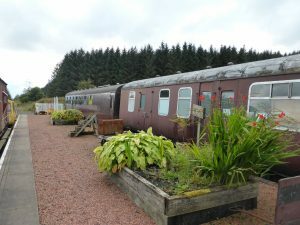 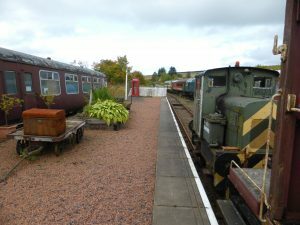 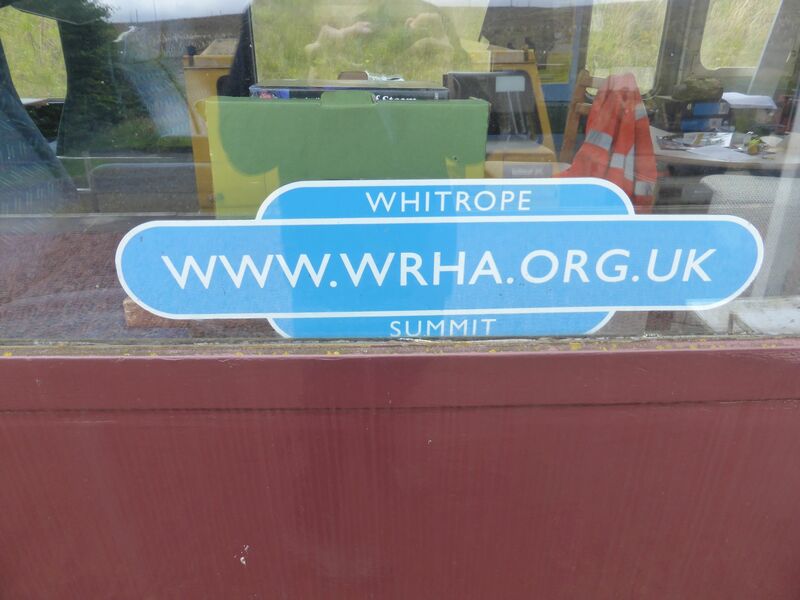 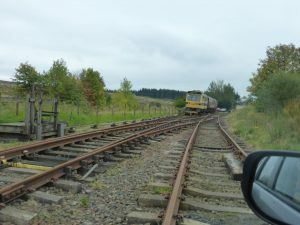 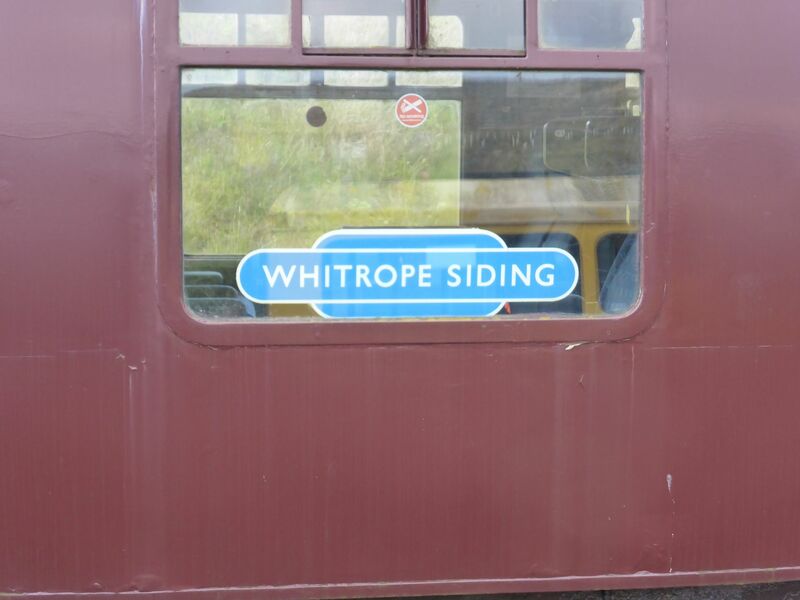 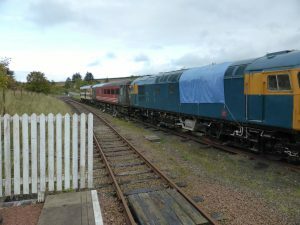 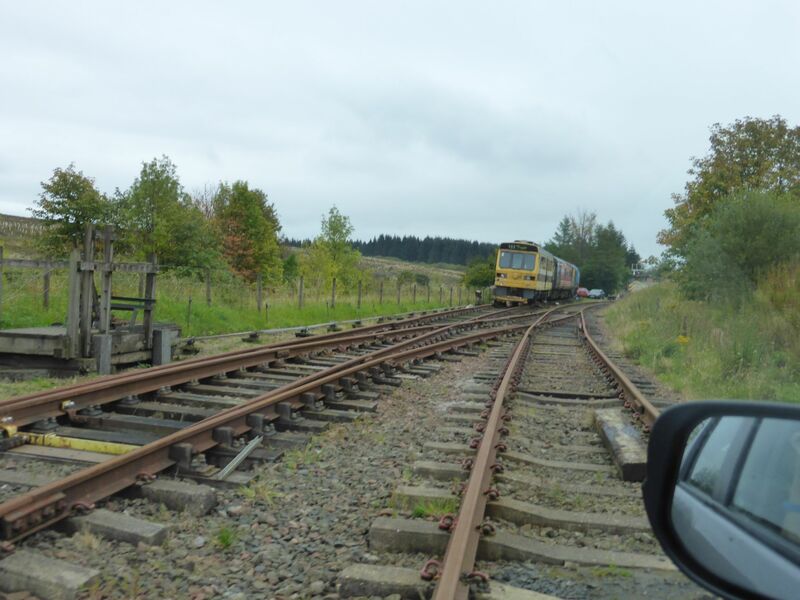 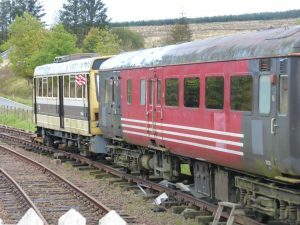 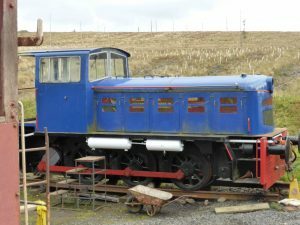 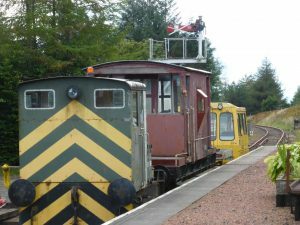 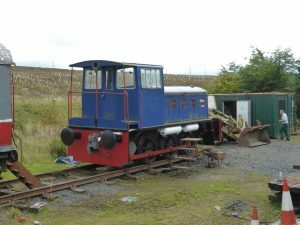 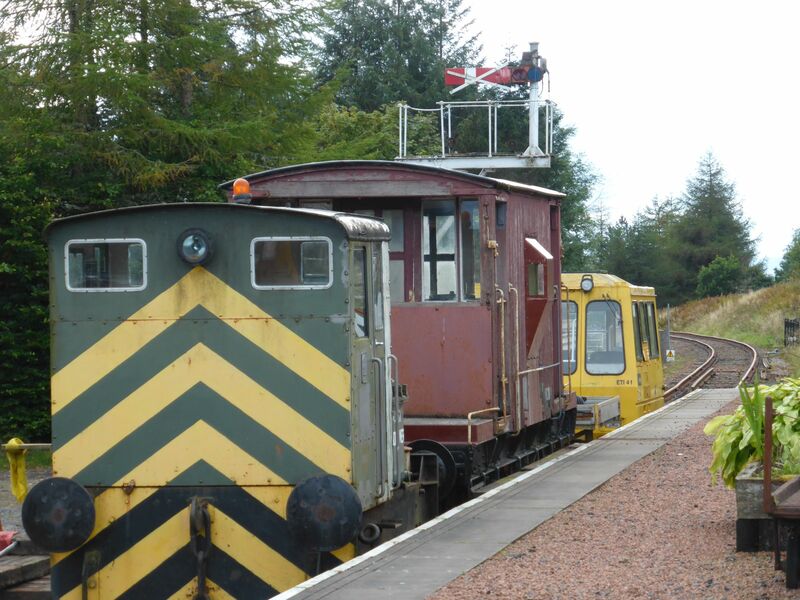 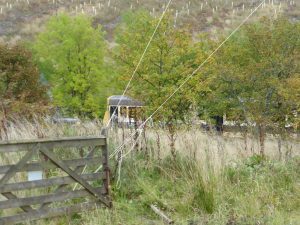 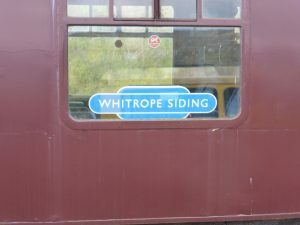 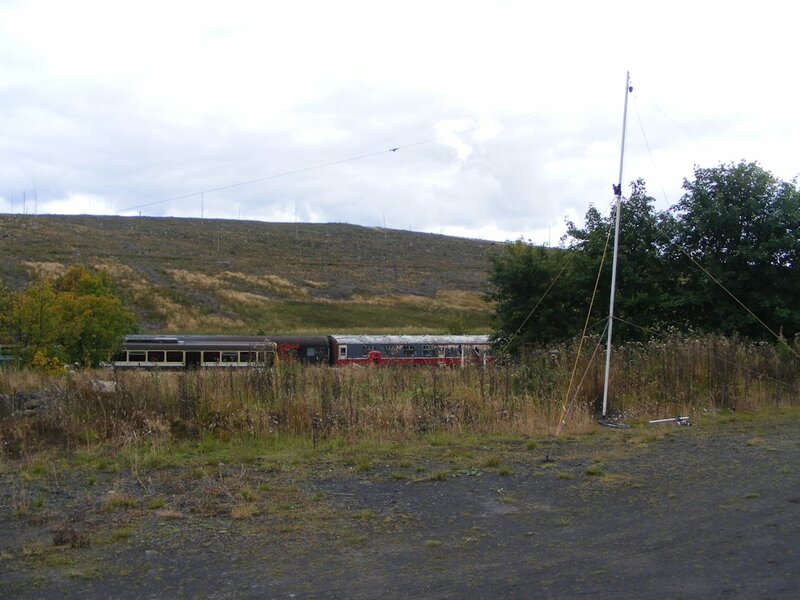 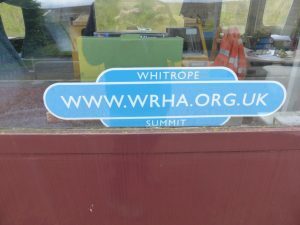 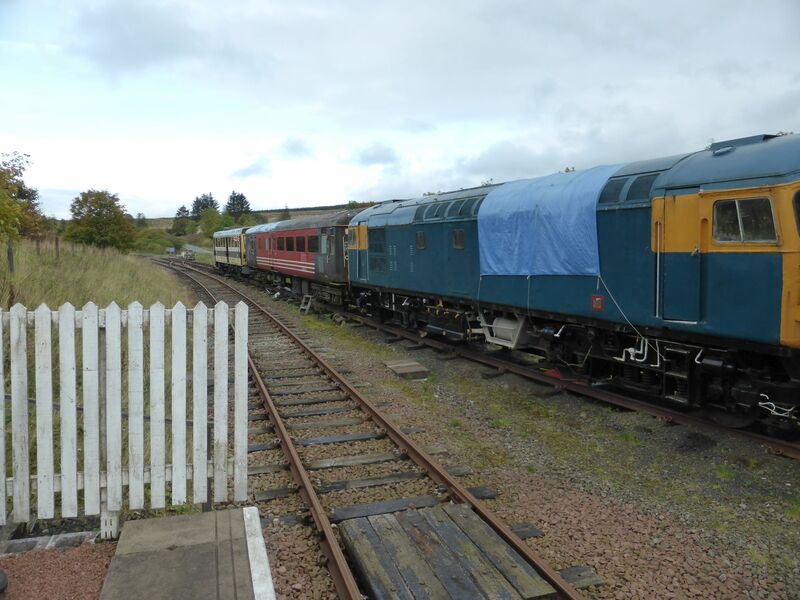 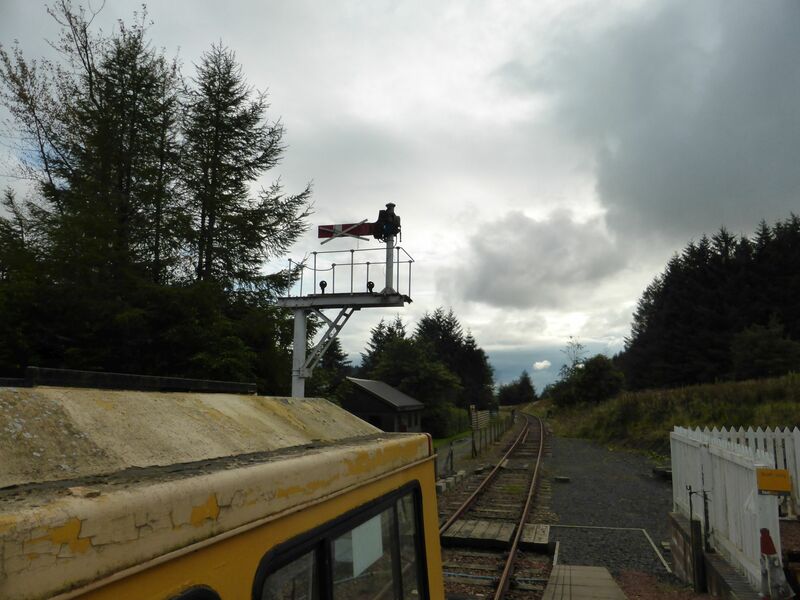 On Saturday 23rd / Sunday 24th September 2017, members of the club were at the Whitrope Heritage Centre on the old Waverley Route, south of Hawick, taking part in the annual “Railways On The Air” special event. 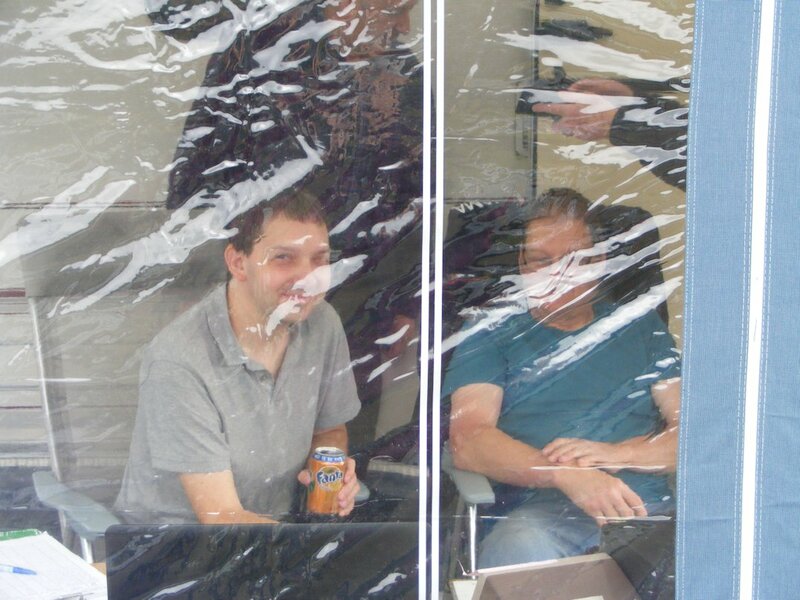 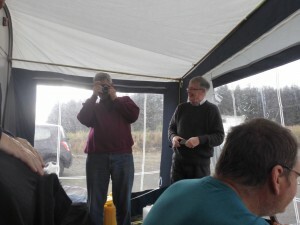 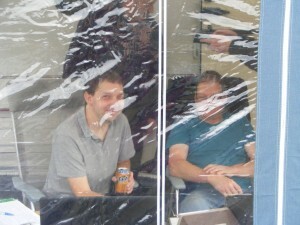 Many thanks to those who took part (the two Daves) and the others who visited and helped set up. 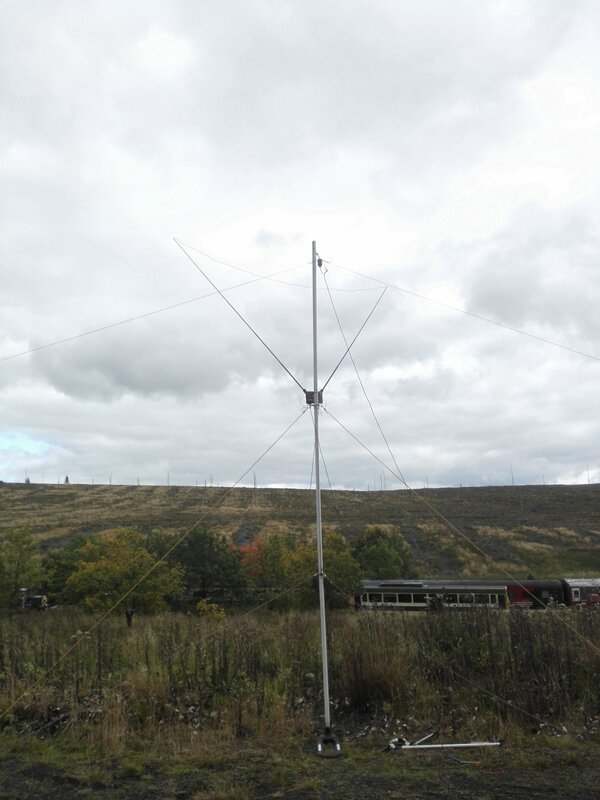 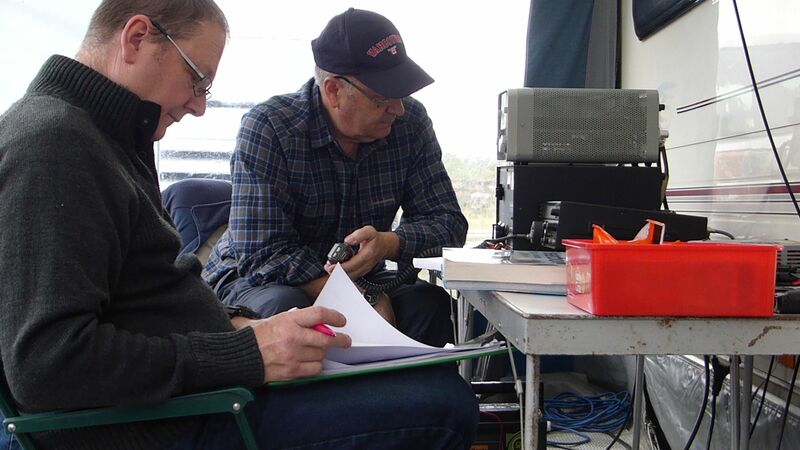 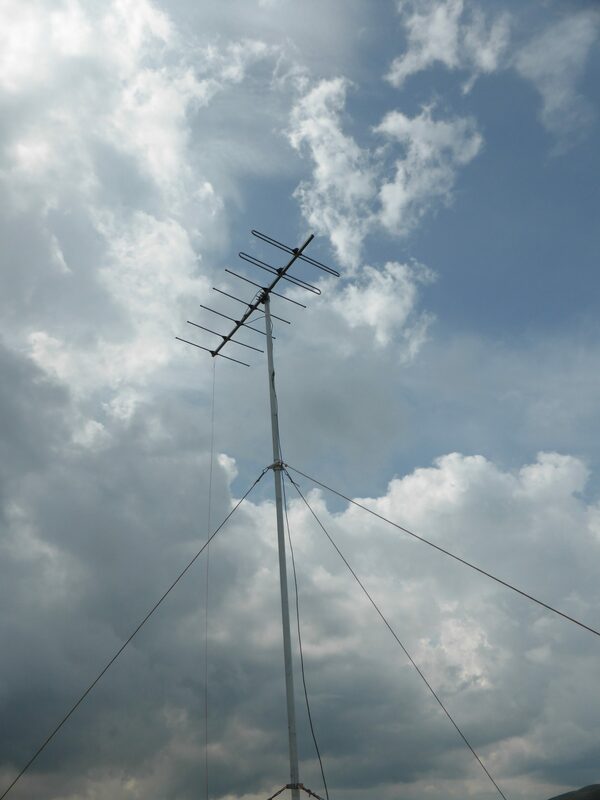 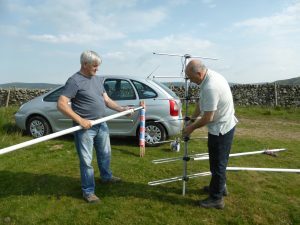 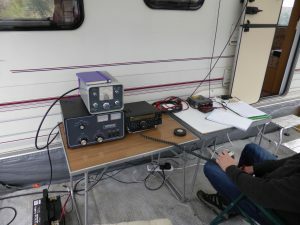 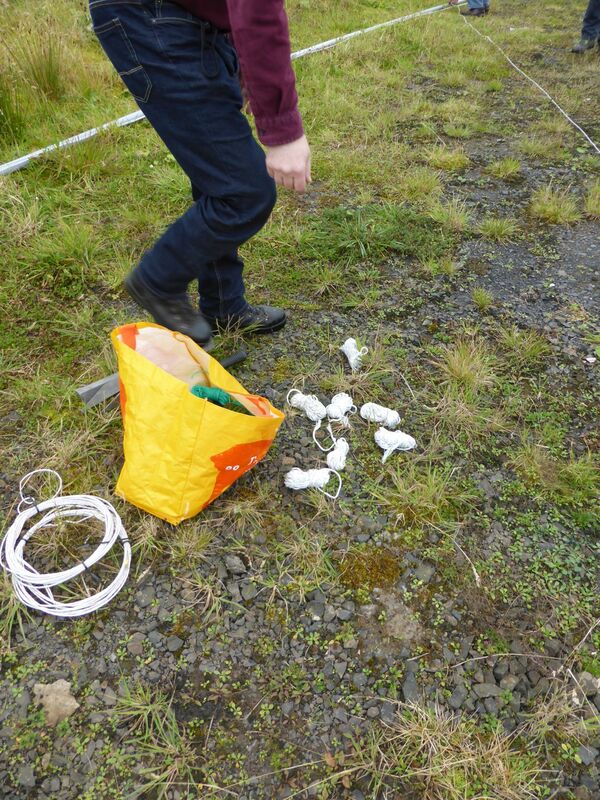 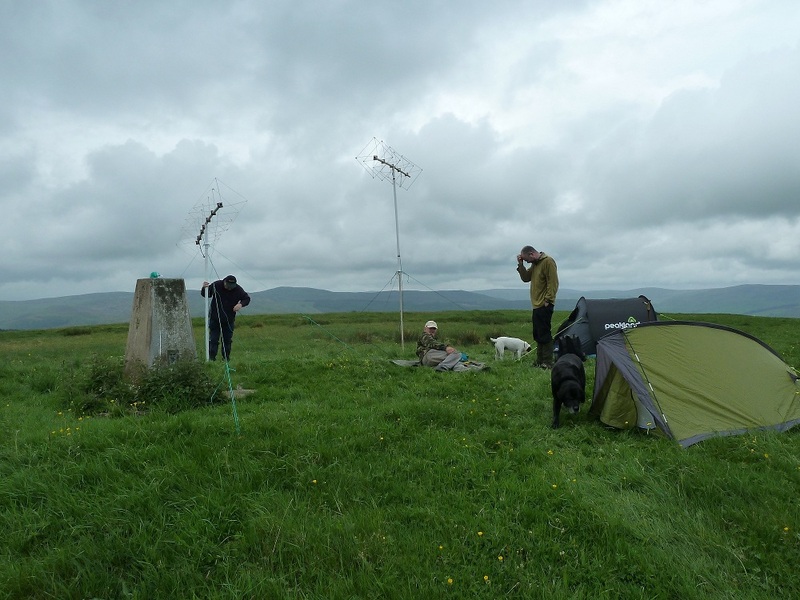 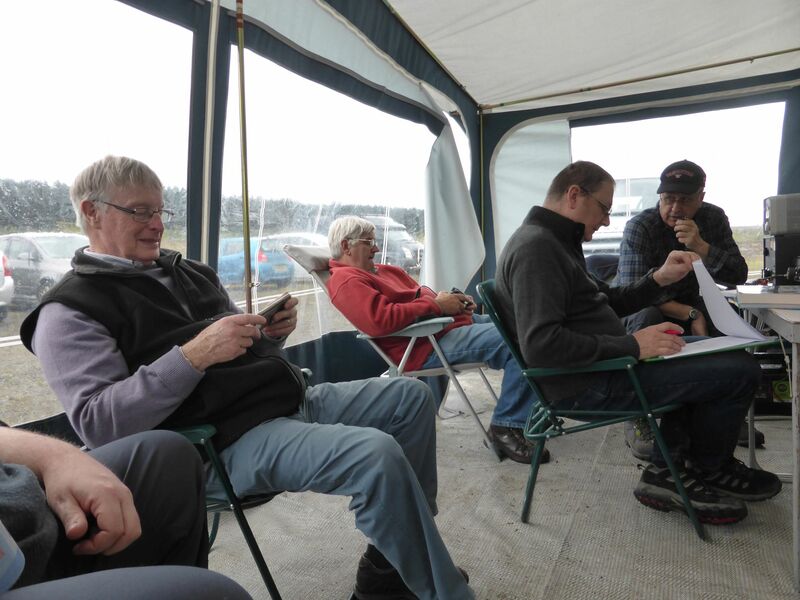 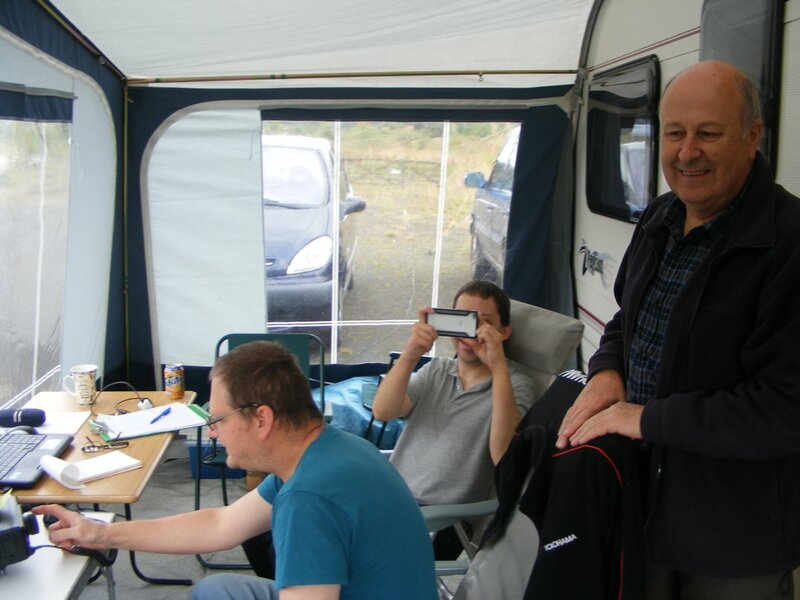 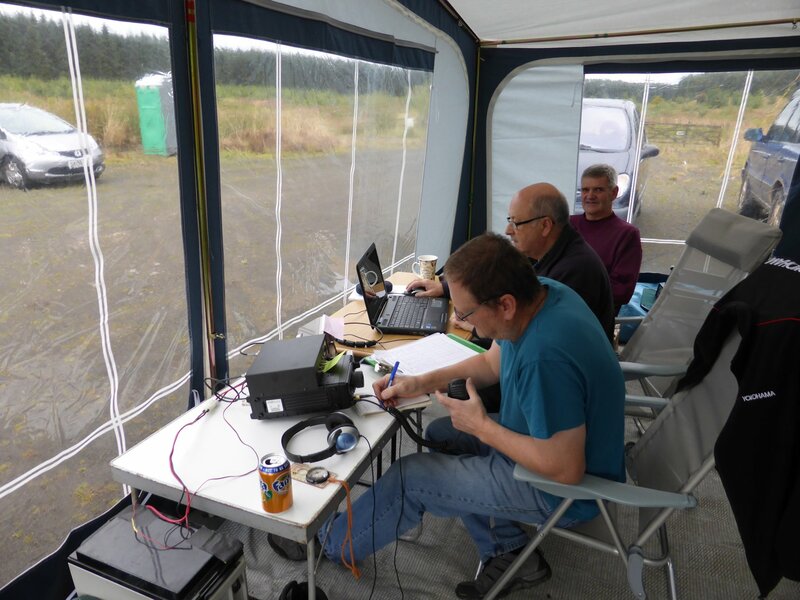 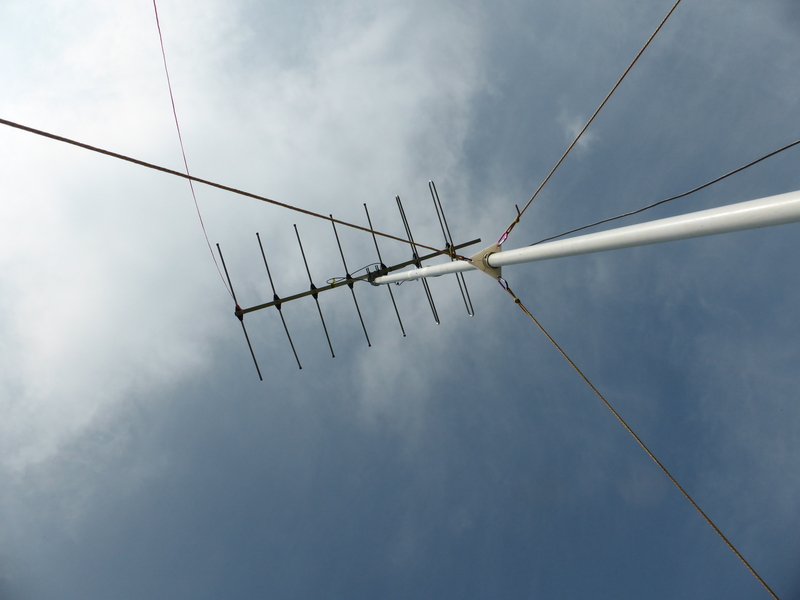 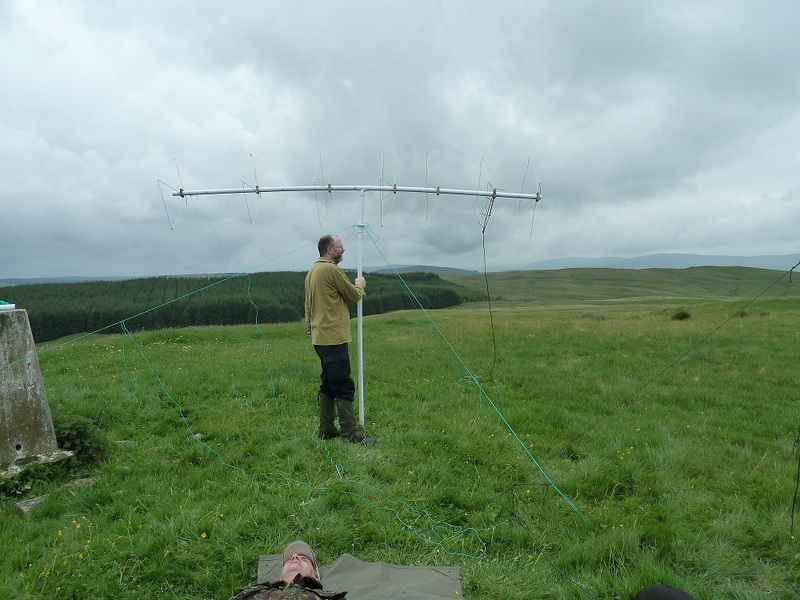 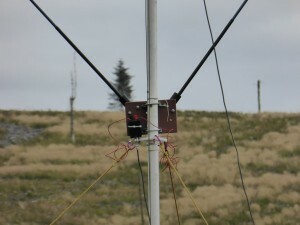 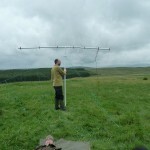 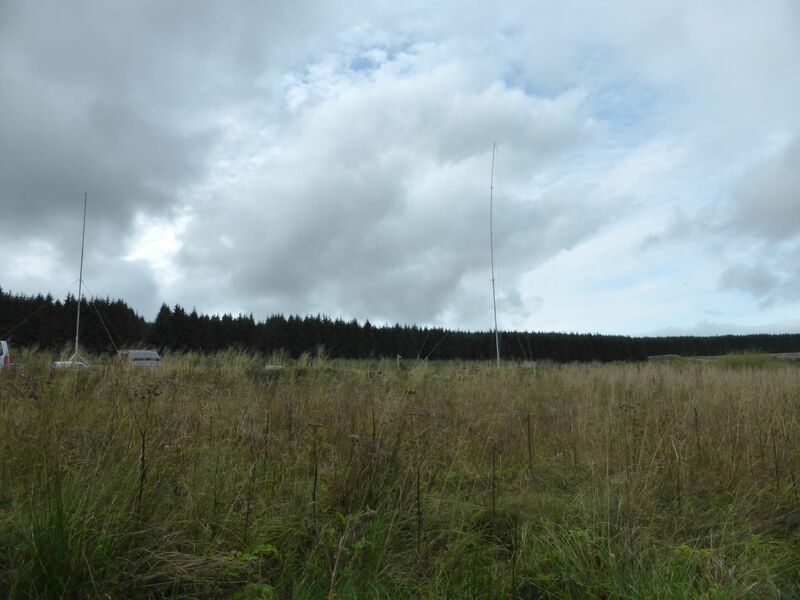 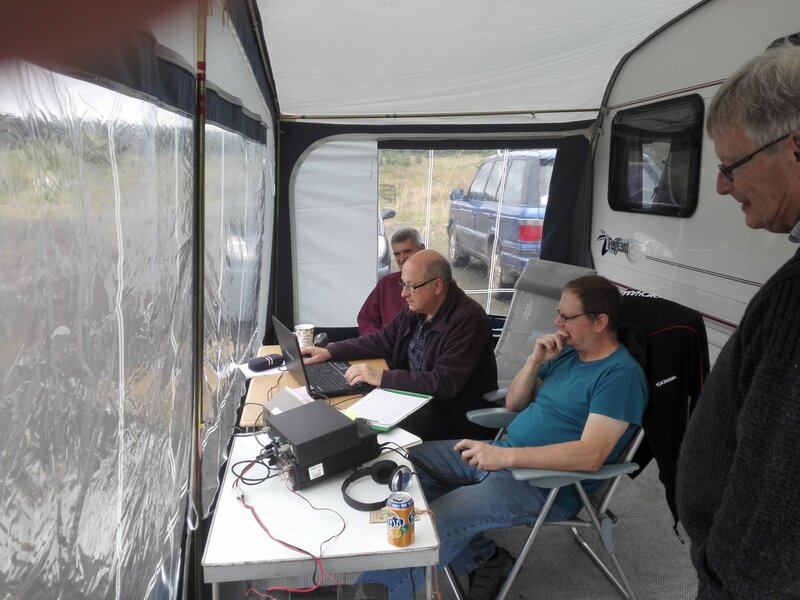 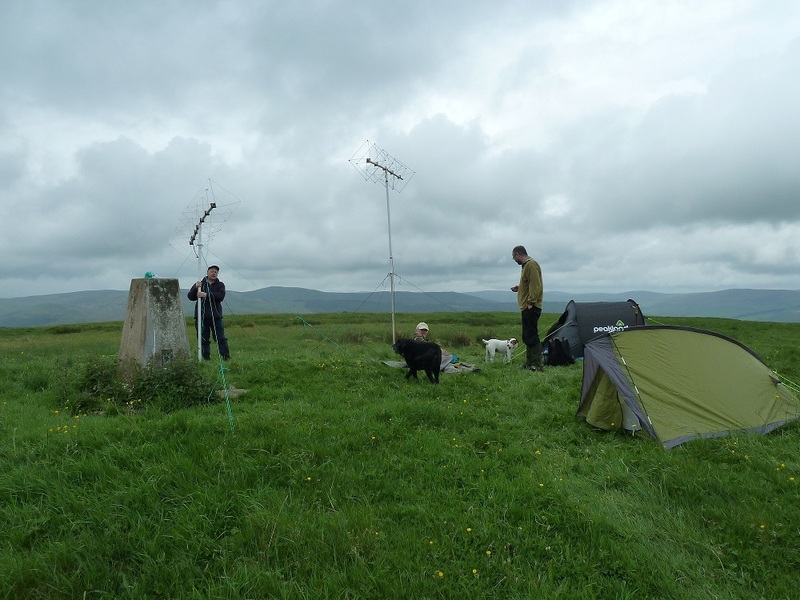 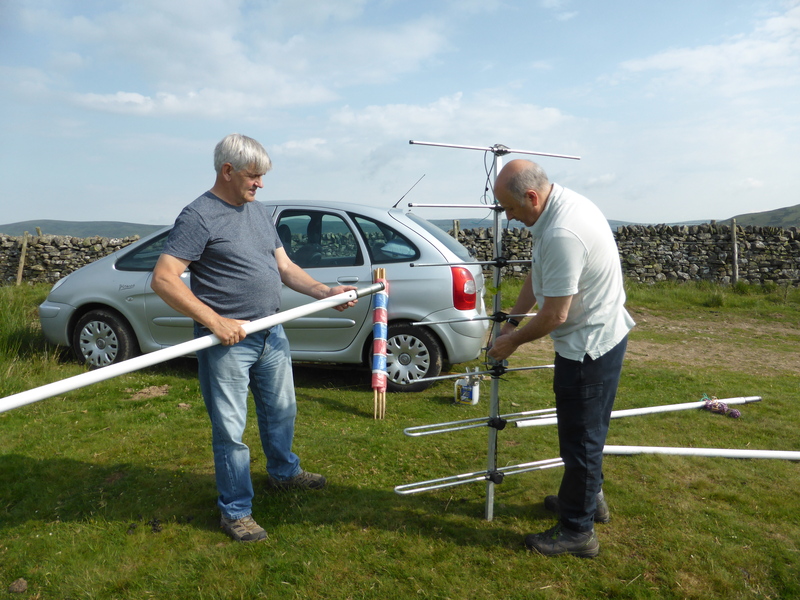 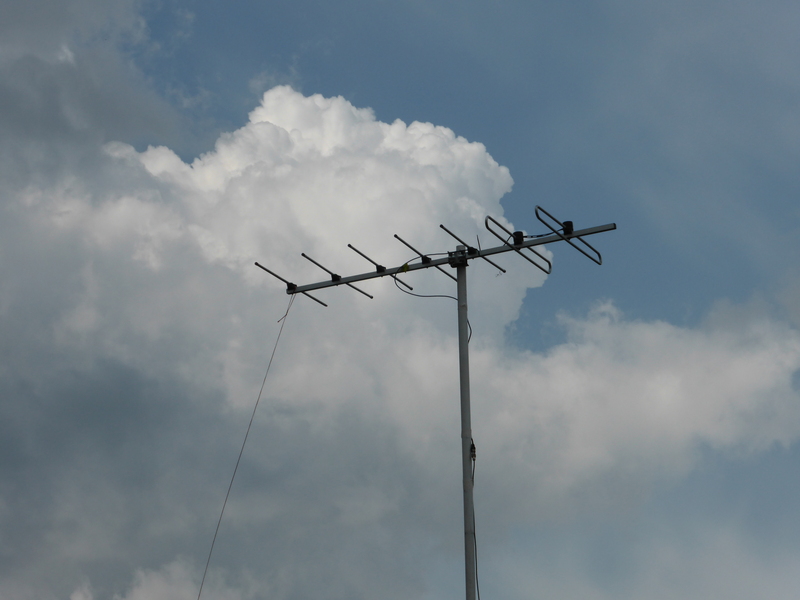 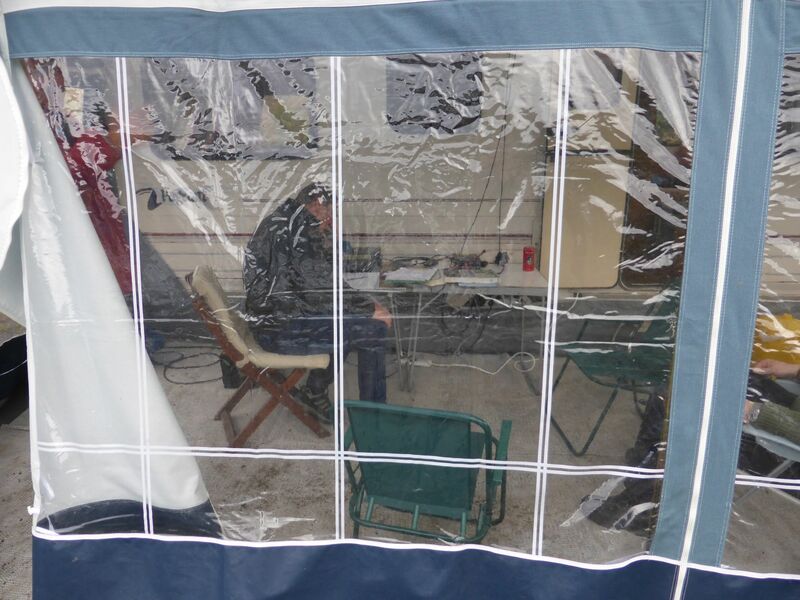 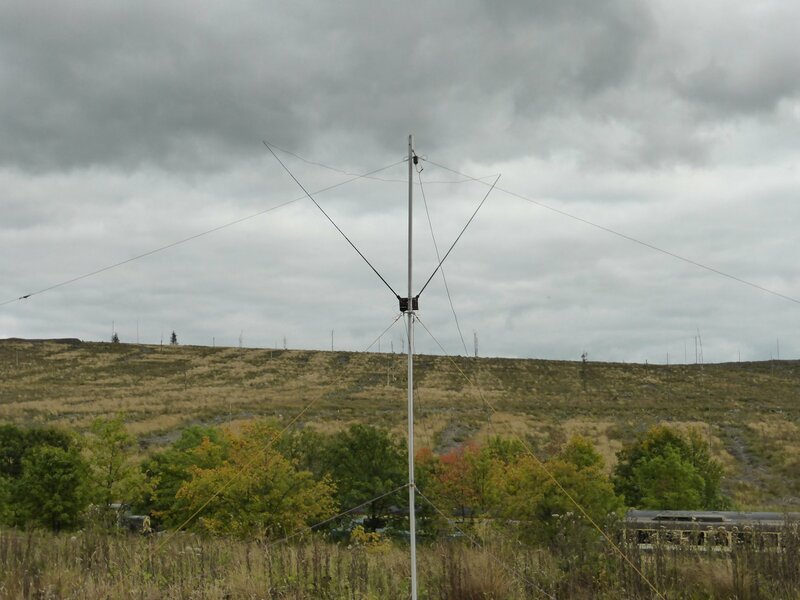 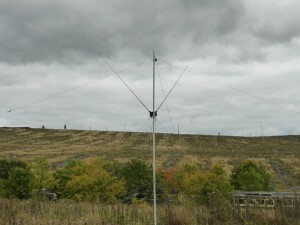 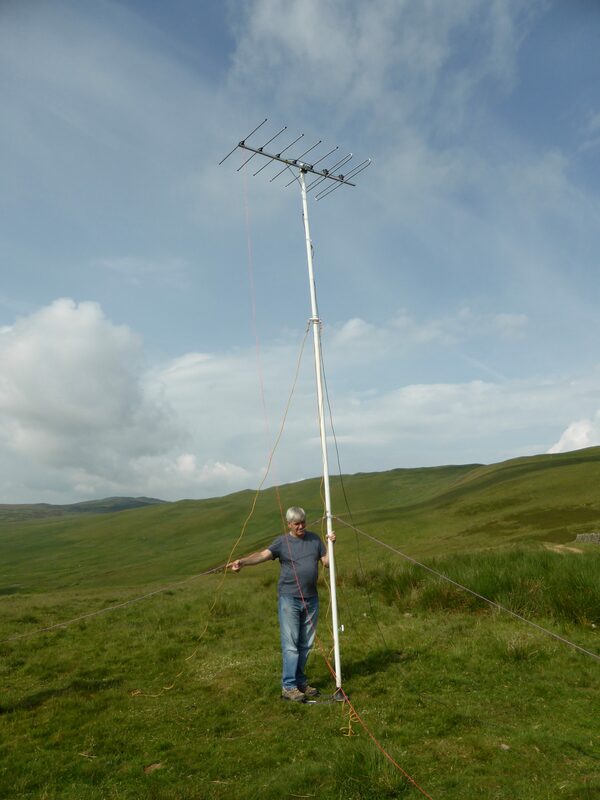 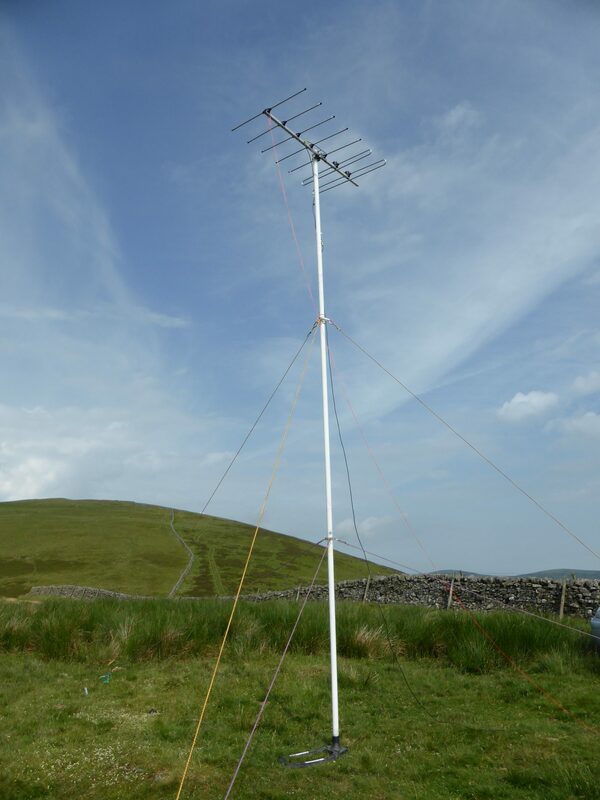 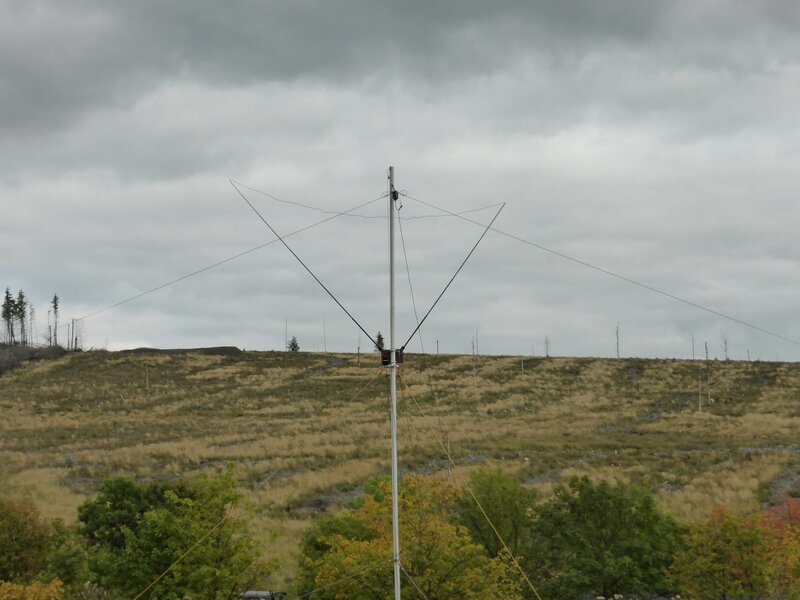 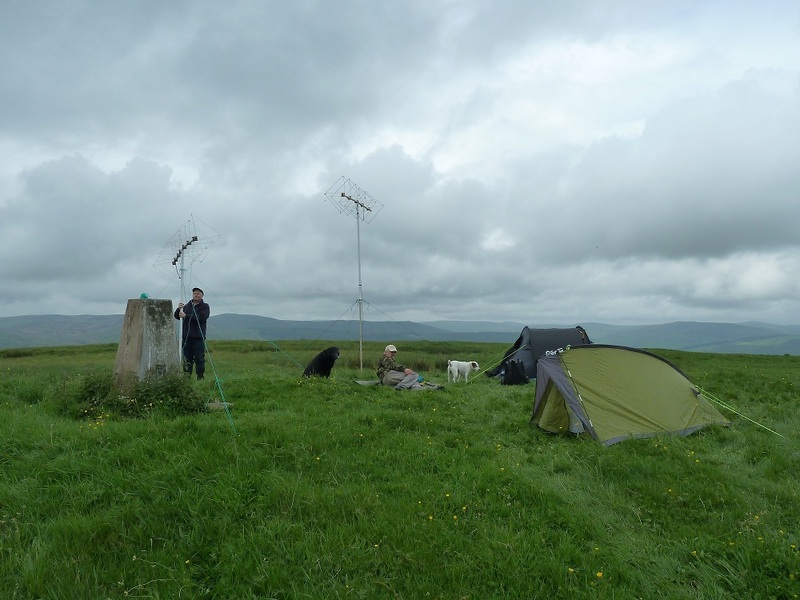 A few of our members took part in this year’s annual Practical Wireless 144MHz Contest. 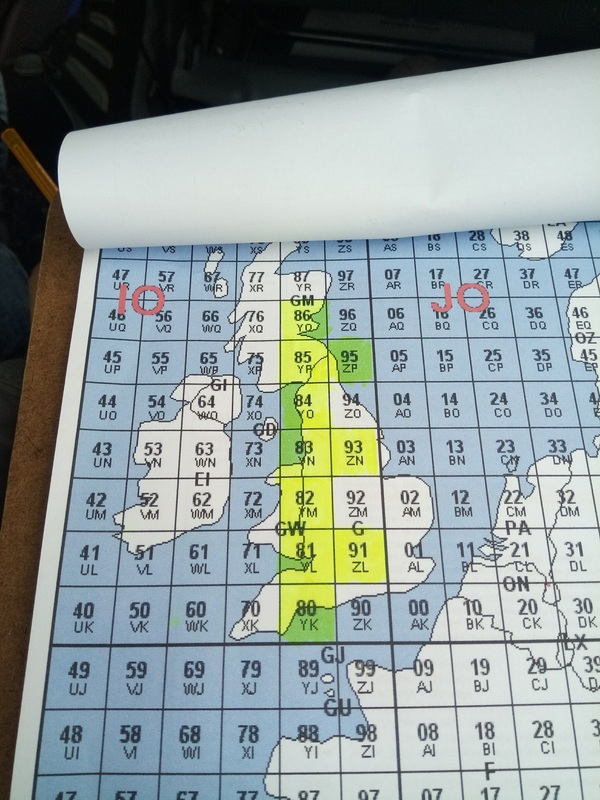 17 contacts made, 10 different locator squares. 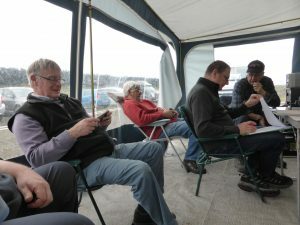 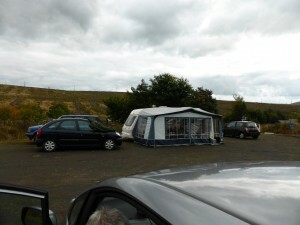 Good time was had by all despite the howling winds and bucketing rain. 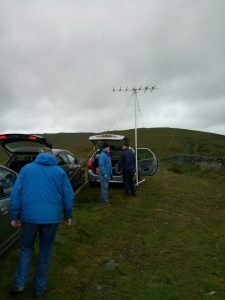 Many thanks to all for helping out, and thanks to Dave S for the bacon rolls!! 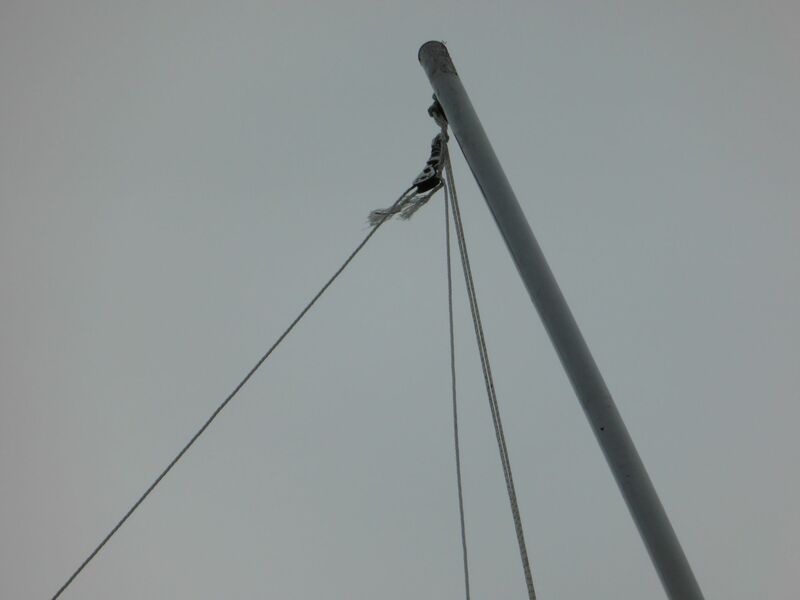 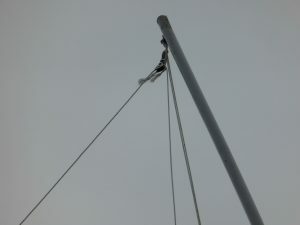 Dave S GM0KCN making final adjustments to the mast. 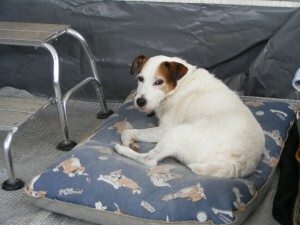 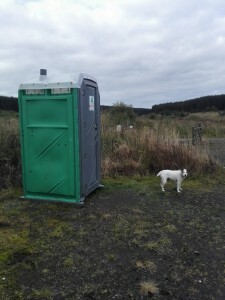 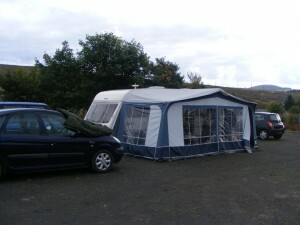 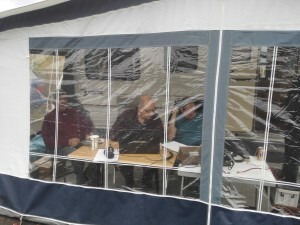 Temporary “shack”. 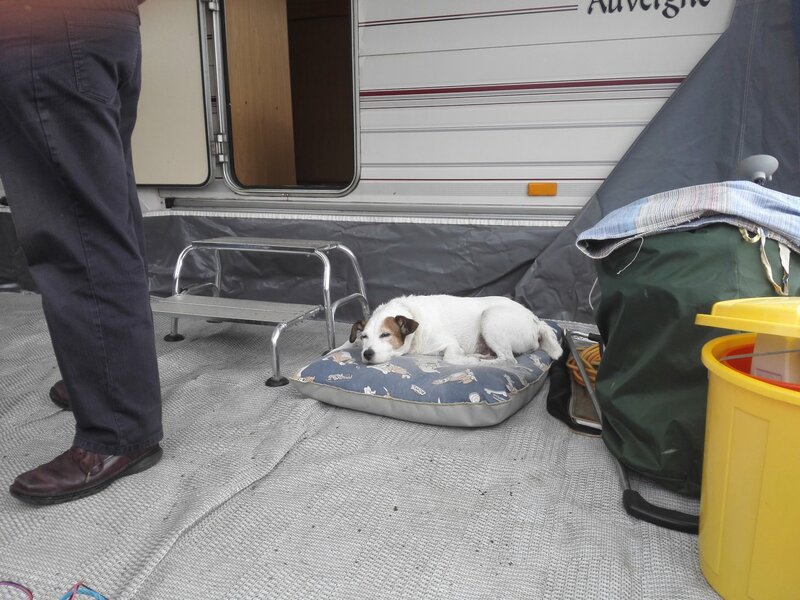 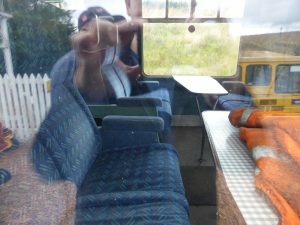 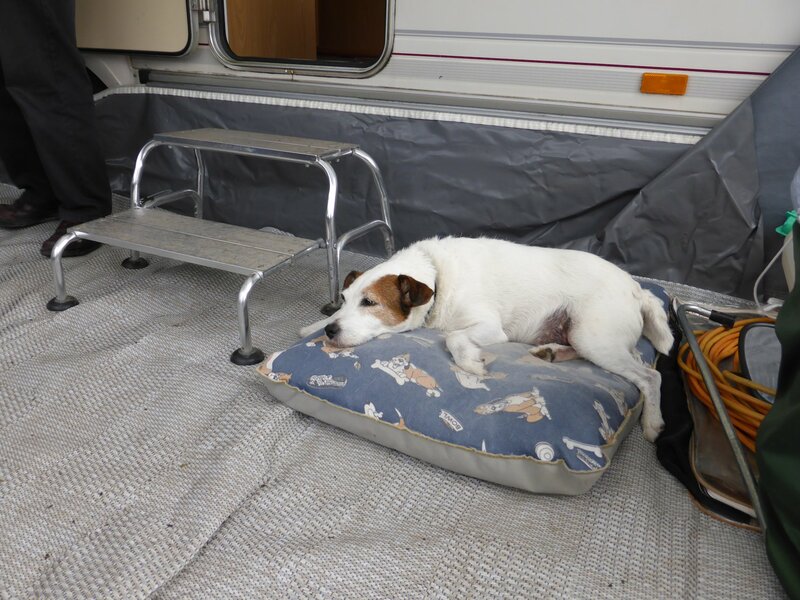 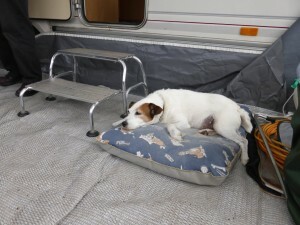 Could have done with more cushions though… Plenty legroom though. 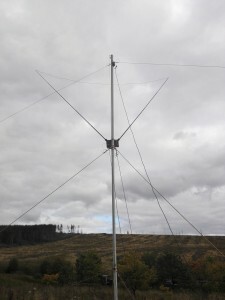 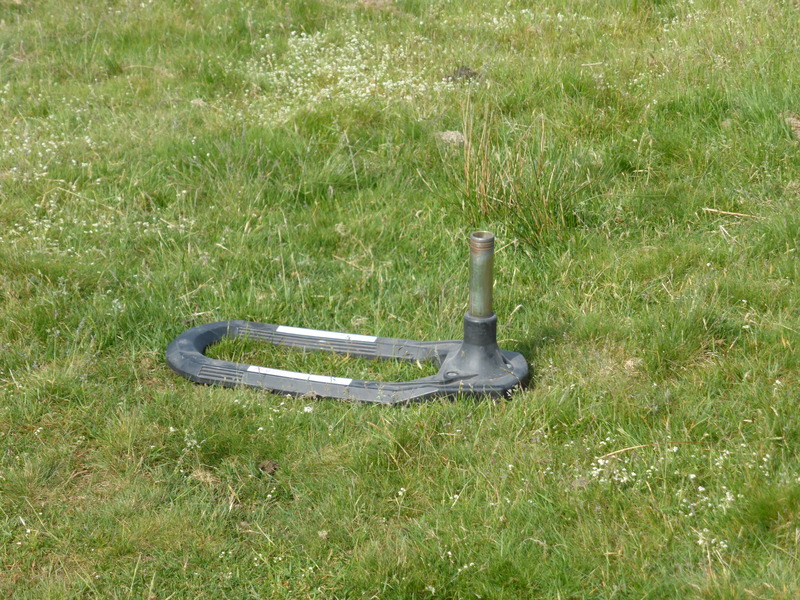 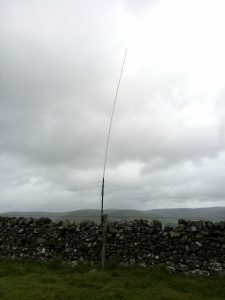 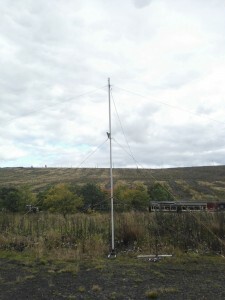 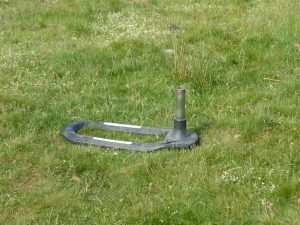 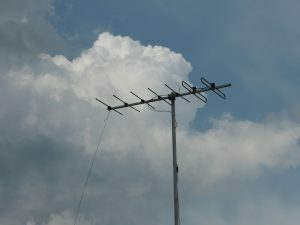 Main antenna for making contacts. Weekend at Whitrope Heritage Railway between Hawick and Newcastleton. 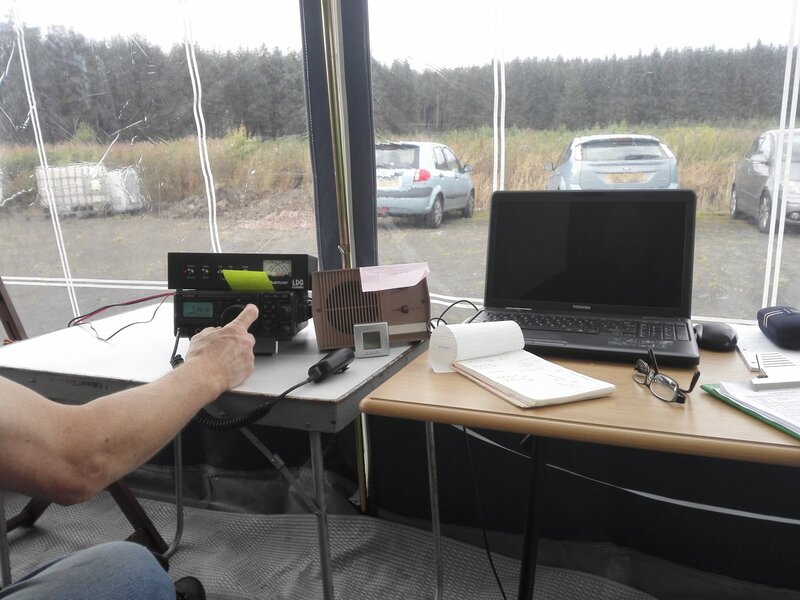 Callsign in use GB0WRH. 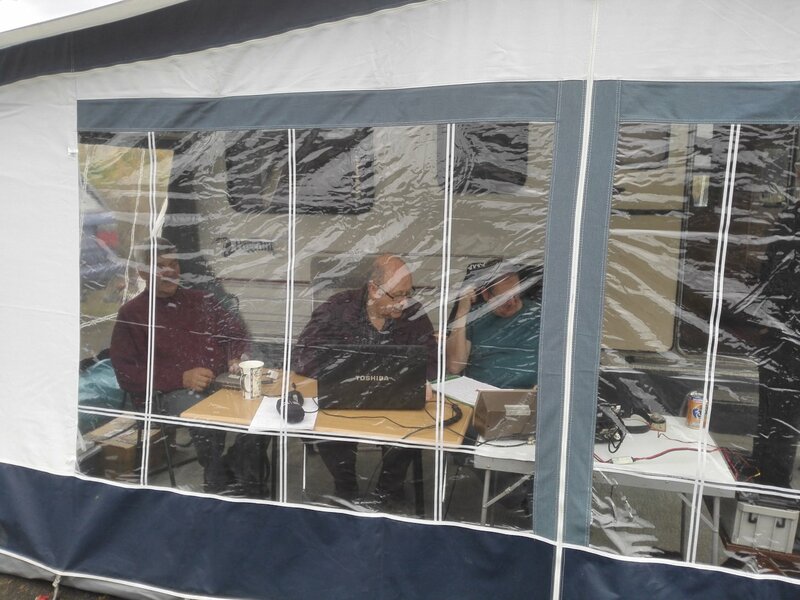 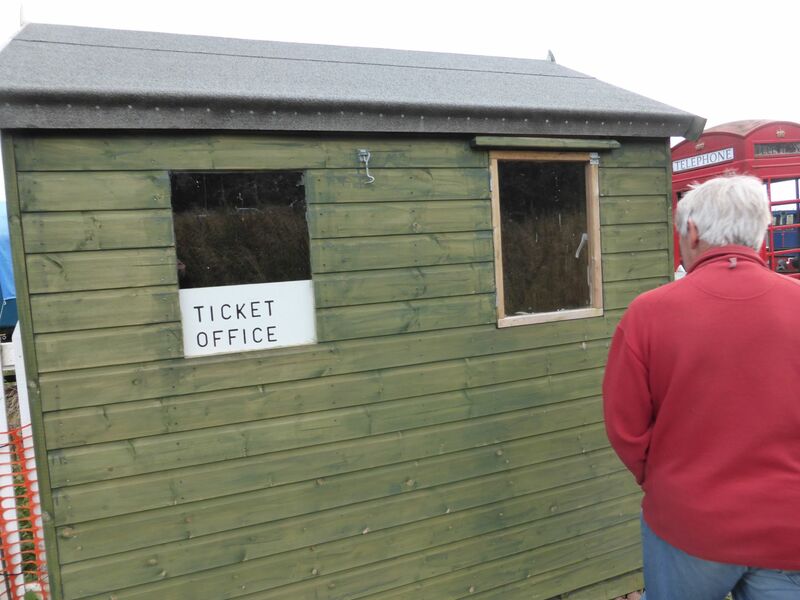 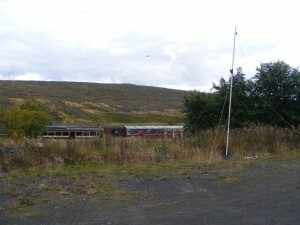 Station mainly operated by Dave S GM0KCN and Dave H MM0HTL.